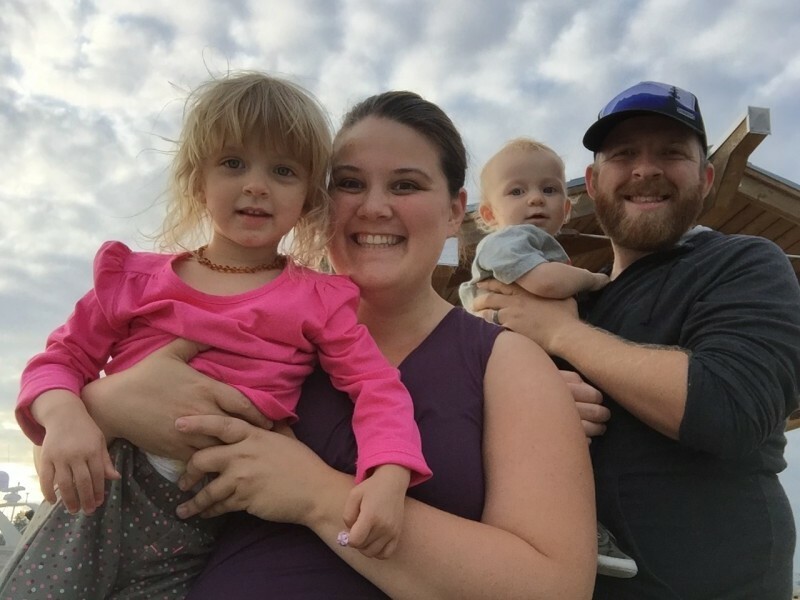 I don’t know what it is, but finding a reliable sitter has been a challenge for us. So, getting to go out on a date night is a rare treat. Friday night we finally had a long overdue date night that included a trip to Keller Auditorium to see Riverdance. We didn’t really know what to expect, except a whole lot of Irish step dancing. Neil was open to going, but a little less enthusiastic than I was about the whole thing. But, in the end we had a really great time. We arrived a bit early and were able to grab a drink, chat and just enjoy each others company. Once we found our seats we just soaked up the time sitting together having an uninterrupted conversation before the show started. Once the show started, I was instantly drawn into the music and the dancing. While Irish step dancing isn’t really my thing I couldn’t help but be impressed by the dancers; how in sync they were, how fast their feet moved and just how beautifully choreographed the production was. When intermission came, Neil and I both took out our phones (I know not so date night appropriate) but we were curious to learn more about the show and started googling the back story of the show and how it came to be. Once we learned a little more we put our phones down and picked up the program and read all about the amazing musicians and dancers. The show started back up and once again I was hypnotized by the dancers quick feet. It was almost like they were floating at times. The second half of the show included our favorite scene, Trading Taps, which was a tap off between the Irish step dancers and two American tap dancers. The two American tap dancers were so engaging, hilarious and talented. The entire scene had us laughing and clapping because it was just fantastic. Overall, I was very impressed with the show. It was so well done and the music director/fiddler was both of our second favorite parts of the show. Just so much talent in one show. I definitely left the show with more of an appreciation for Riverdance than I had come in with. 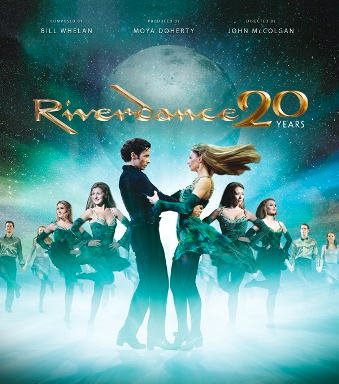 Don’t forget to check to see if the Riverdance 20th Anniversary tour is coming to your city! We had a wonderful date night out at the theater and we can’t wait to return again! Who is ready to to kick off the 2015 Holiday Season? We are! 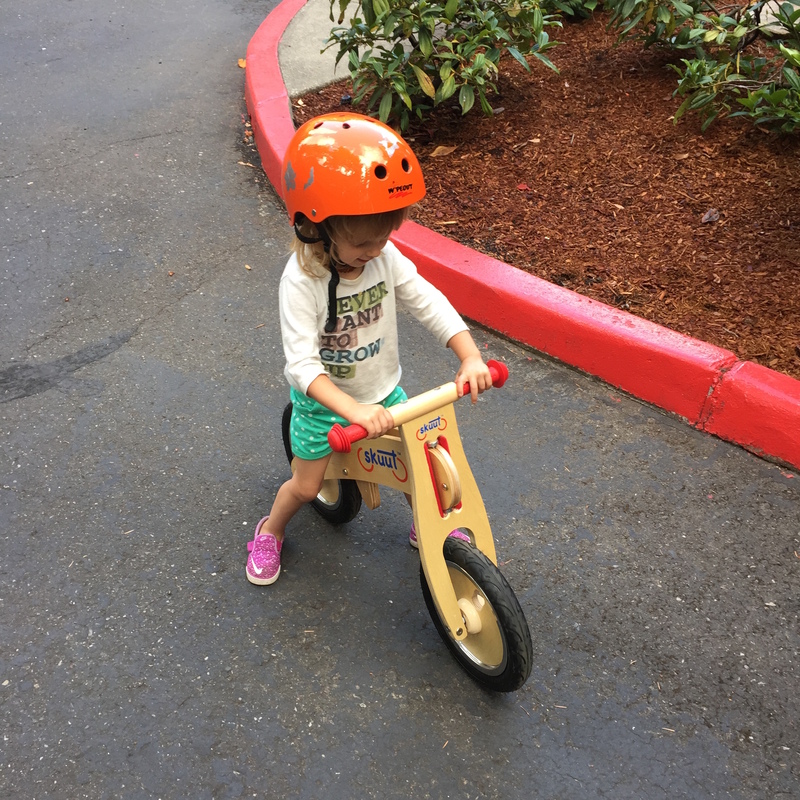 I have been taking stock of all of the fun activities going on in the Portland area this week and thought I would share a few with you. November 26th: You have probably heard of a Turkey Trot but how about a Tofurky Trot? Join Tofurky for a 5k pre-Thanksgiving dinner race. 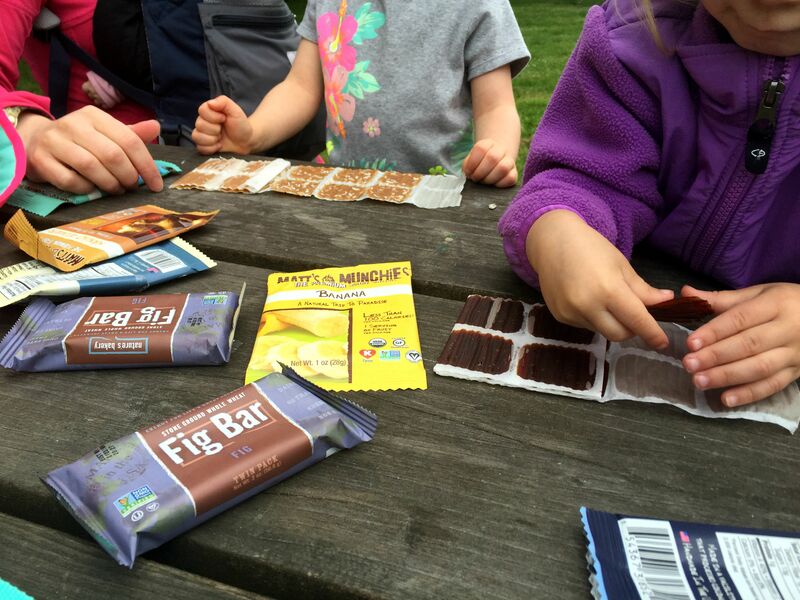 Especially great for plant-based families! November 27th: It’s the annual My Macy’s Holiday Parade on Friday morning. This has been a yearly tradition of ours and we are looking forward to attending once again this year. The parade runs from 9-10am and goes through downtown Portland – you can find all the route details here. Tip: DRESS WARM. I don’t know what it is about the day after Thanksgiving but it is always freezing in Portland so make sure you dress nice and warm for this parade. November 27-28th: This is one of my favorite weekends of the year because Little Boxes! 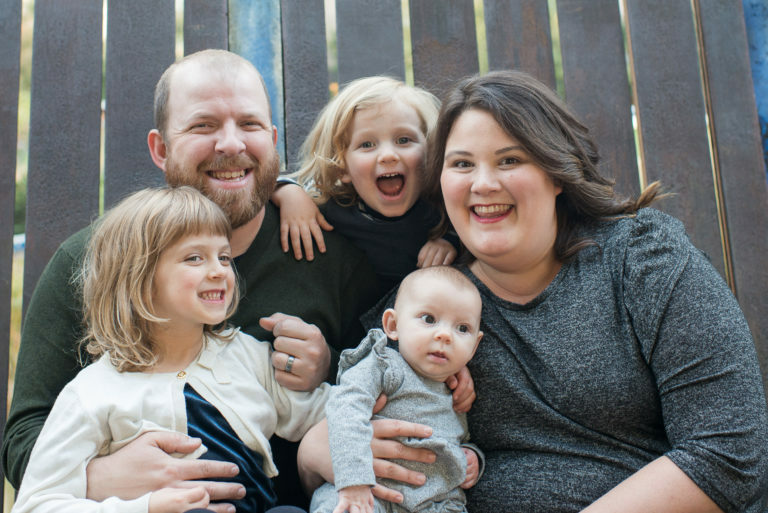 Little Boxes is a city wide event that really takes Black Friday and Small Business Saturday to a new level. This event encourages you to check out participating local shops and they make a game out of it by including a raffle with really amazing prizes. November 27th-January 3rd: Another annual event for us is Zoolights at the Oregon Zoo. 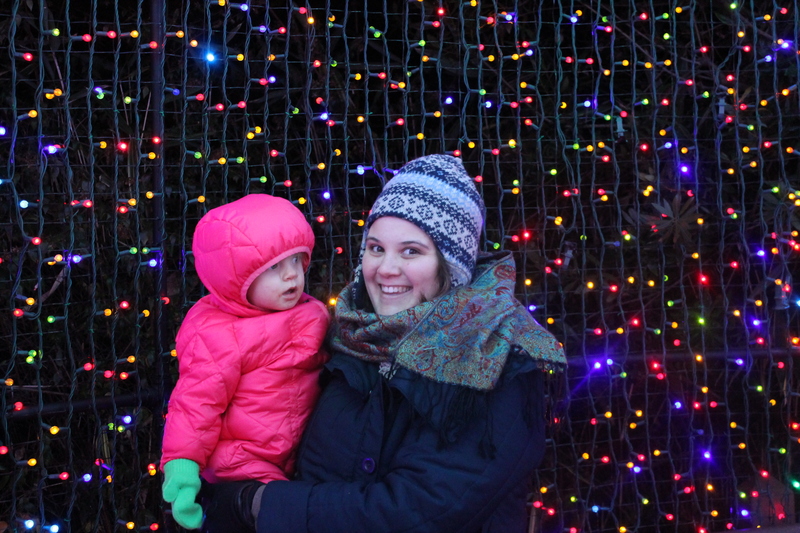 Another event to bundle up for but it’s so much fun to see all the lights, ride the train and visit the bats. Also checkout their value nights if you are looking to attend but want to save a few dollars. What holiday events are you looking forward to this year? 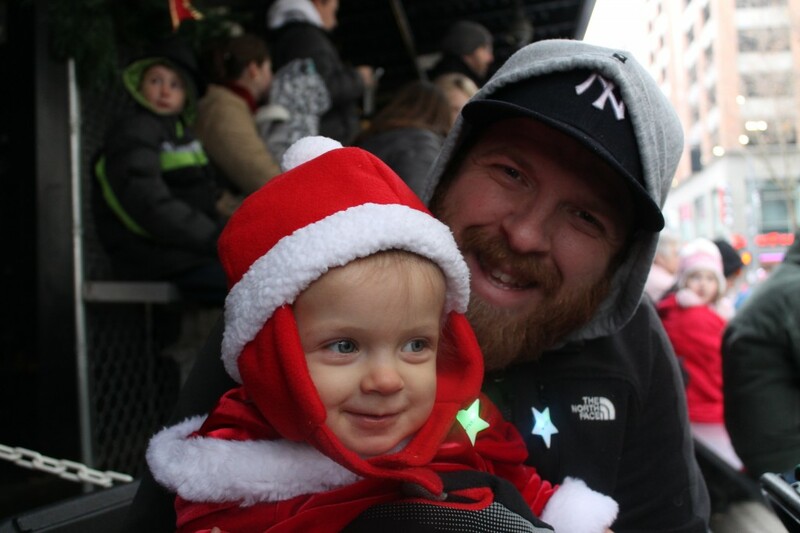 If you’re in Portland what are you favorite holiday events? 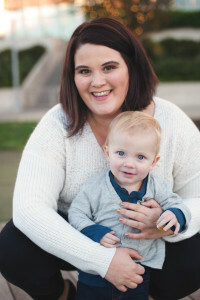 I hope you enjoyed this post and if you’d like me to post one weekly for this holiday season let me know! Of the two of us Neil is the outdoor explorer. He is the hiker, the backpacker, the adventurer. For him it’s a passion. Me? I love camping and hiking but usually only after complaining or looking for excuses to bail on things. That’s until we had children. 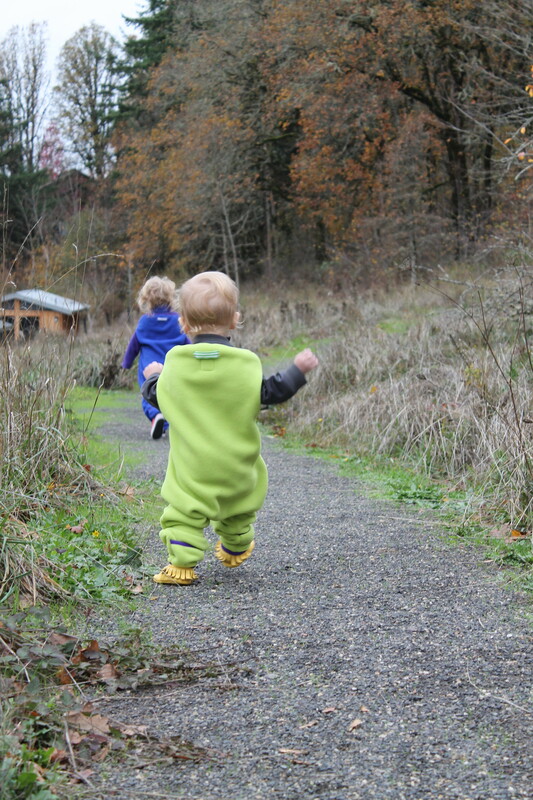 Having children put the outdoors in the forefront of my mind. 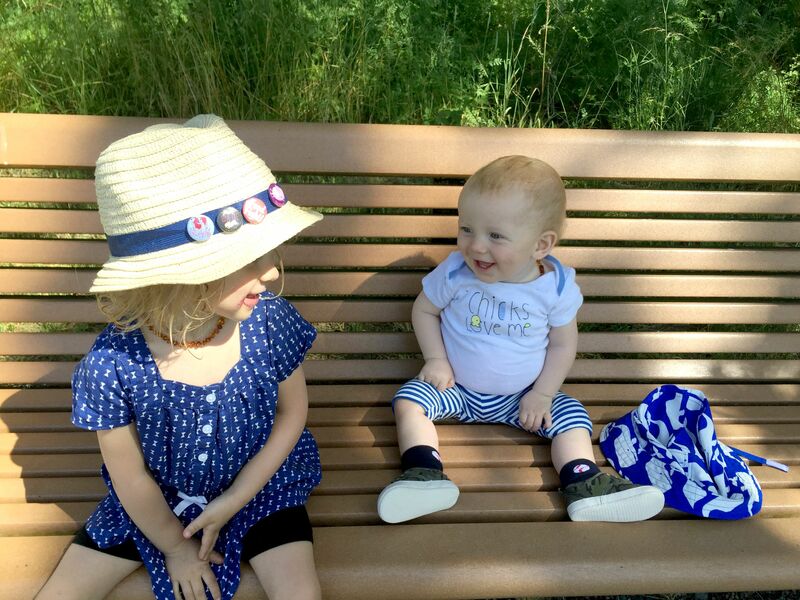 I want them to spend as much time as possible enjoying the great outdoors, exploring, getting dirty, breathing in the fresh air and using all of their senses to become more familiar with the world around them. 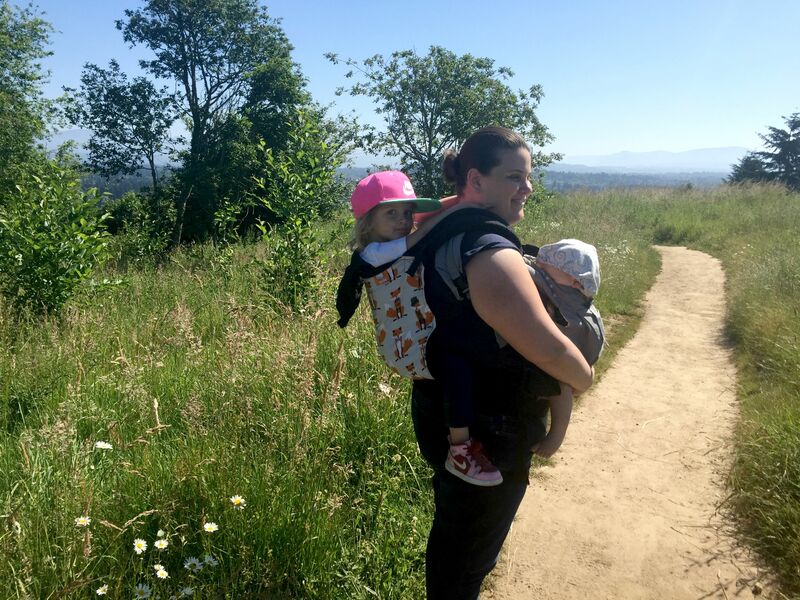 So about a 8-months ago I decided that we would have at least one dedicated nature walk each week on top of the neighborhood outings and weekend family adventures. 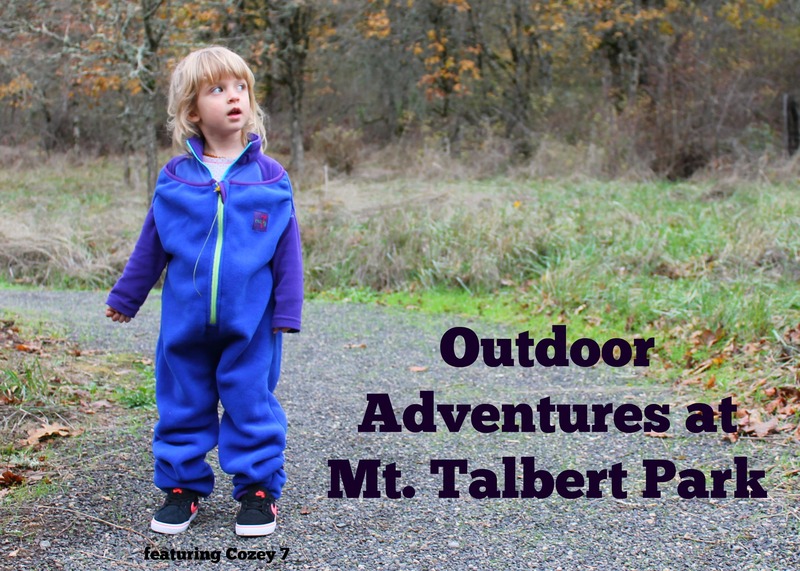 One of our more recent adventures was to Mount Talbert Park in Clackamas, Oregon. I hadn’t planned this outing in advance but after a few long days solo parenting and a cranky afternoon I threw my hands up and said “we are getting out” so I packed us up and out we went. 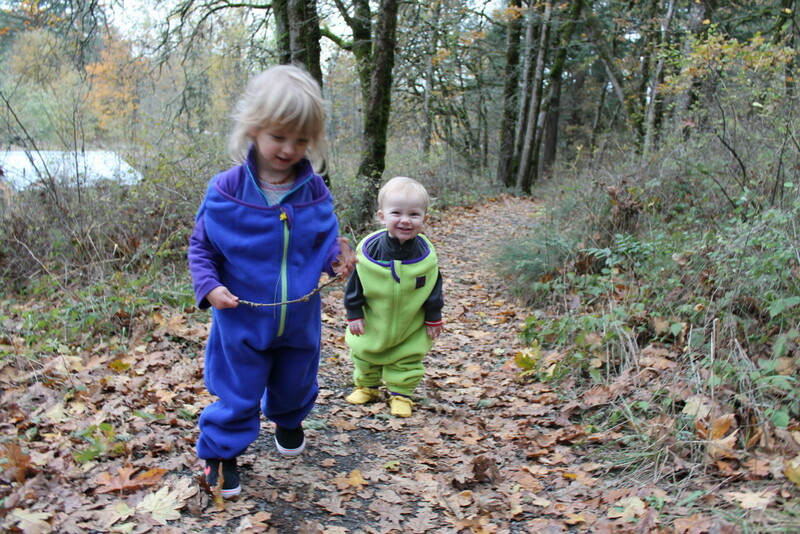 It was a chilly day but the fresh air was just what we all needed and the kids were geared up in their Cozey 7 Trailhoppers so they were cozy and warm. 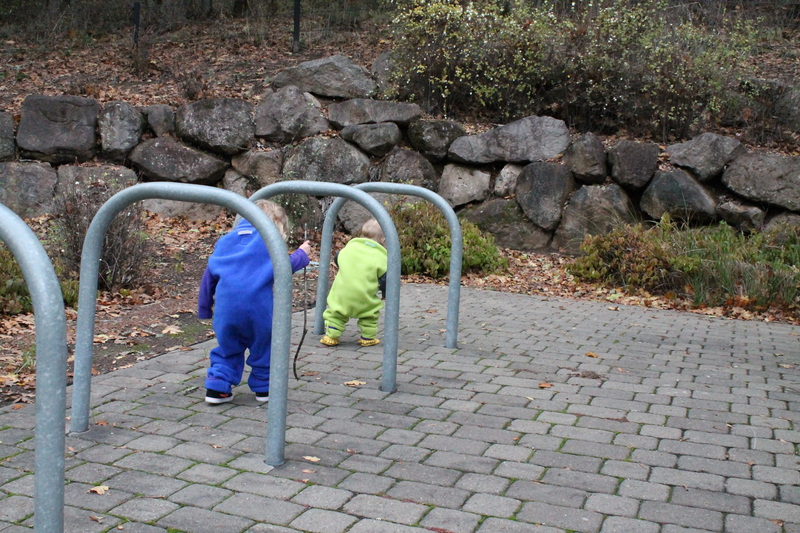 There is a small loop just to the right of the picnic area that was perfect for both A and E to run around and explore. 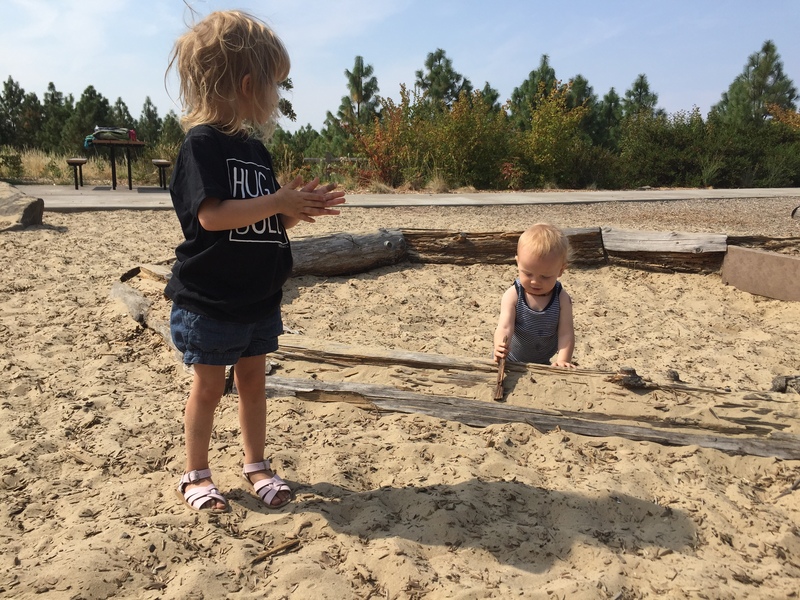 They spent time drawing with sticks in the dirt, playing with the gravel and chasing each other. We also made our way to the paths on the left which were a little steeper and rockier. The path was on the skinny side which is a little more challenging with littles but we made it up about 1/2 a mile before heading back down to have a snack and to do the loop once again. Of course we had to stop and say hello to the squirrel friend as well. 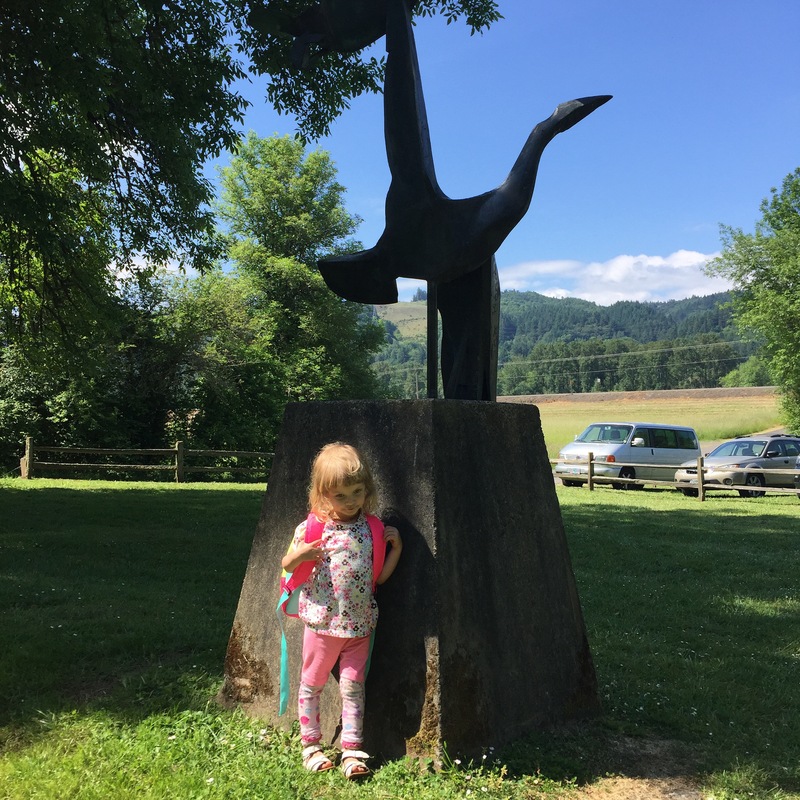 Overall I really enjoyed this nature area however I will say to do the paths that go up in the woods I would feel a little more comfortable wearing A and/or having Neil with us to do those paths but the loop is great and I love that their is a covered picnic area. Disclaimer: Cozey 7 provided us with their trailhoppers at not cost. We were not required to review them but I’m sharing them because I think they are fantastic. 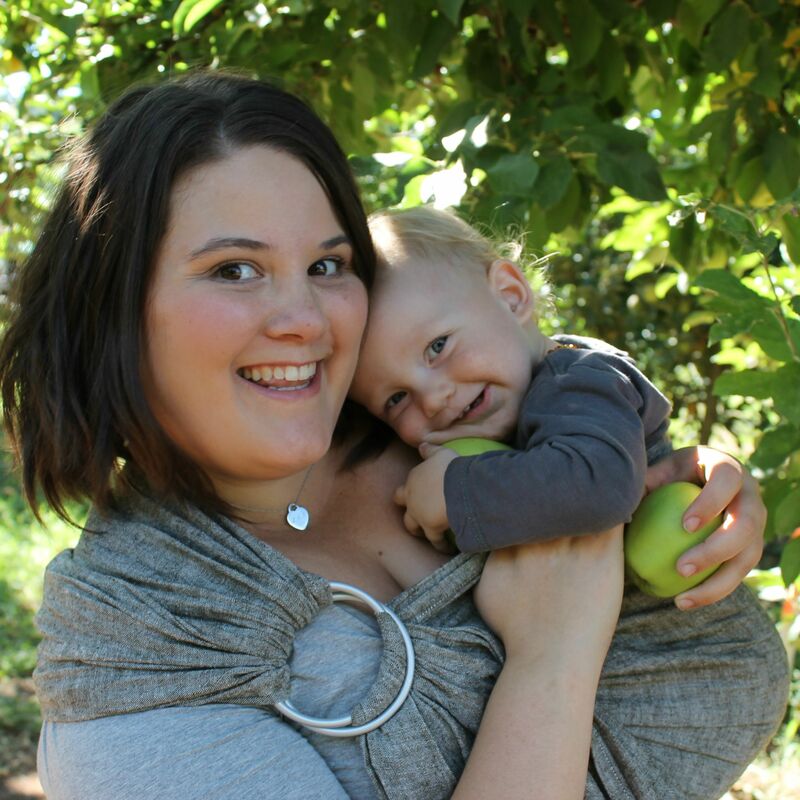 Why do I love Cozey 7 – the trailhopper? I love the wide neck on them that allows them to be worn over most anything without restricting the neck. I also love their little carrying bags and just how high quality they are. 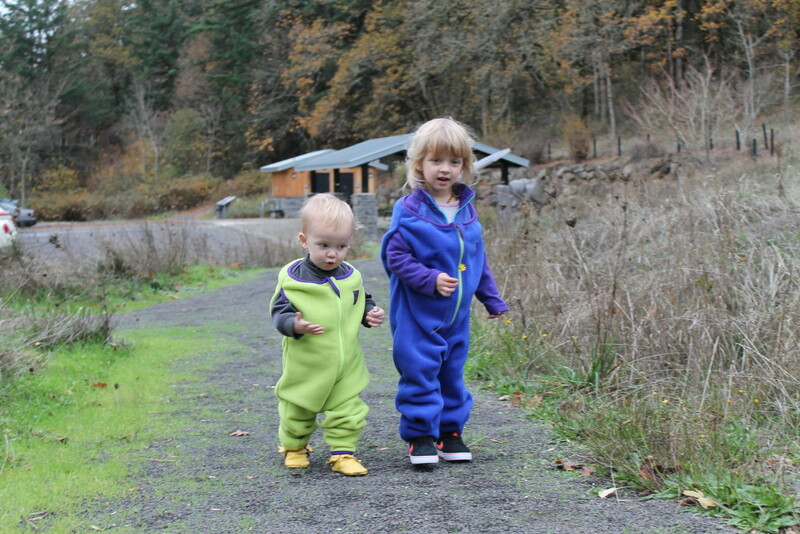 Also they run a bit big but that’s a good thing because it allows them to fit over even bulkier clothes and will last your little ones longer. For reference Edith is around 38 or so inches tall and 28lbs and she fits perfectly (with extra room) in the 18m-2T size. You will surely be seeing them regularly on our blog and instagram over the cool months. Cozey 7 has a kickstarter running right now and I encourage you to check them out. 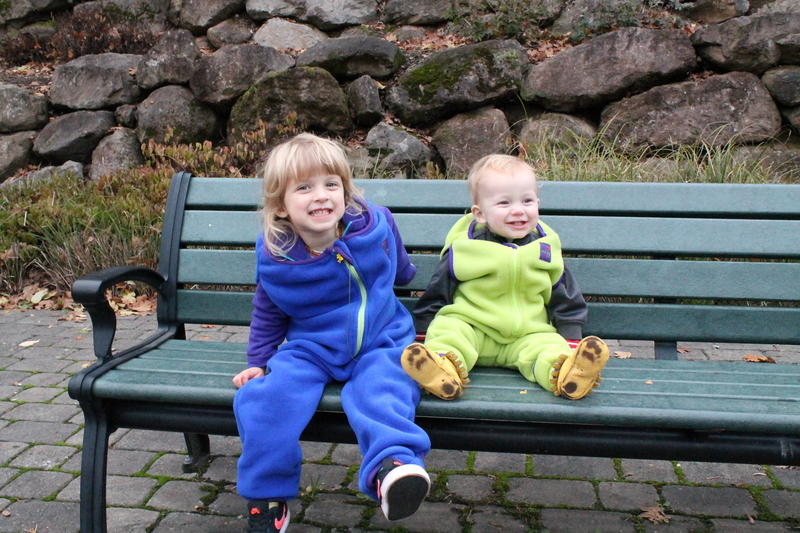 If you love spending time outside with your family and you want to keep them nice and warm these outfits are perfect! 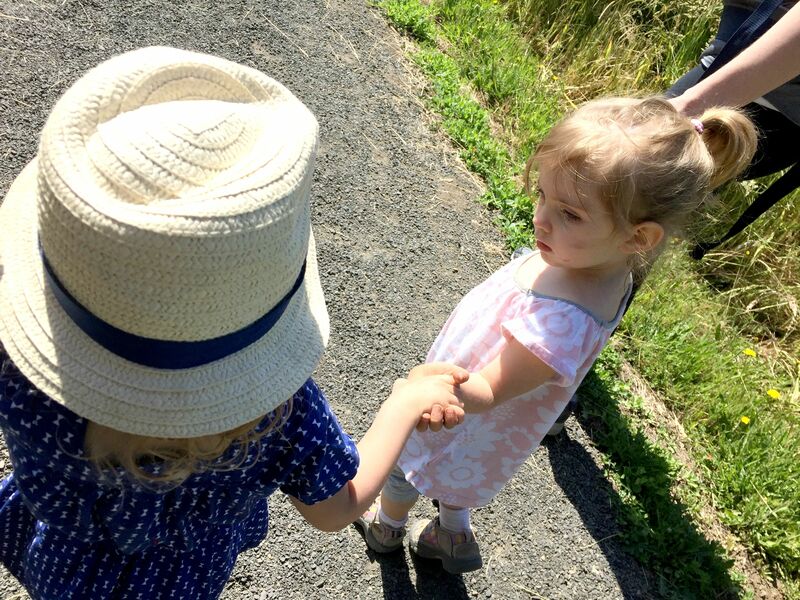 I’m dreaming of warmer days as I write this way overdue blog post. It feels as if Portland went from Summer directly to winter and I am feeling it today. We also have been hit with the winter colds around here hence such a huge space in posts. I actually didn’t realize that we are close to a month since our last post and it was completely unintentional because I have more than enough posts in draft mode. 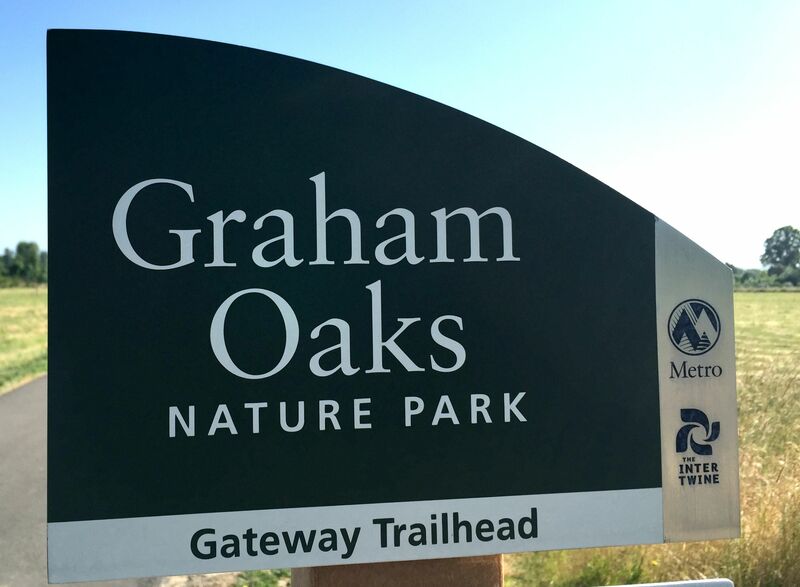 Anyways let me stop the rambling and we’ll get into todays post which is all about our adventure to Graham Oaks Nature Park. 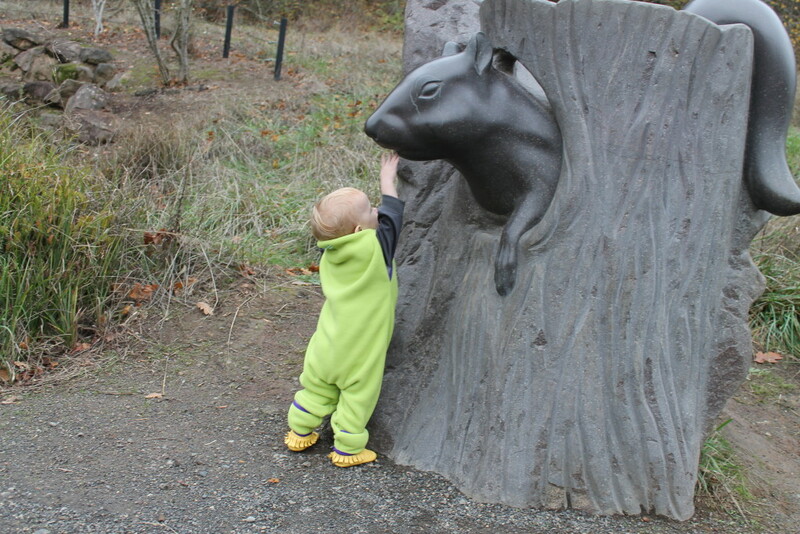 We have been really making an effort to get out and try out the various trail systems and nature parks in the greater Portland area and I have so many to share with you. 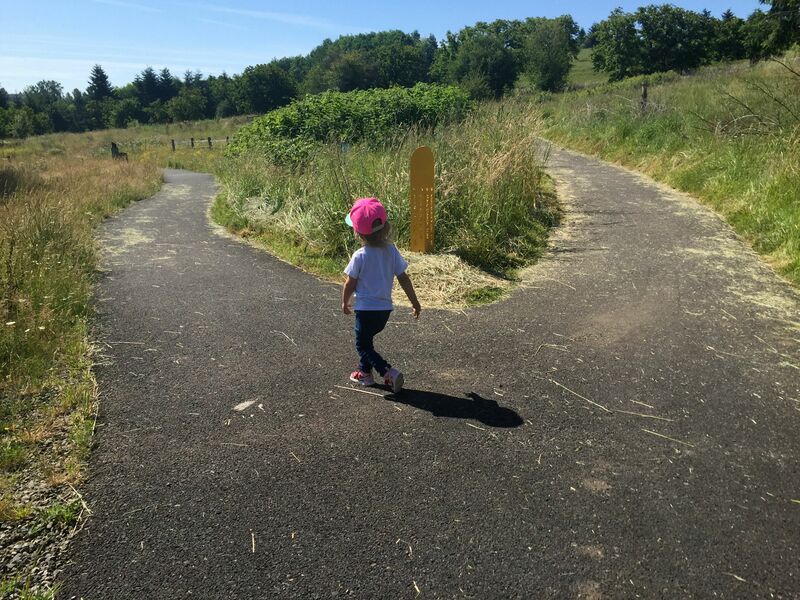 This summer we ventured to Wilsonville to Graham Oaks Nature Park which is a great paved trail as well as a short gravel trail. 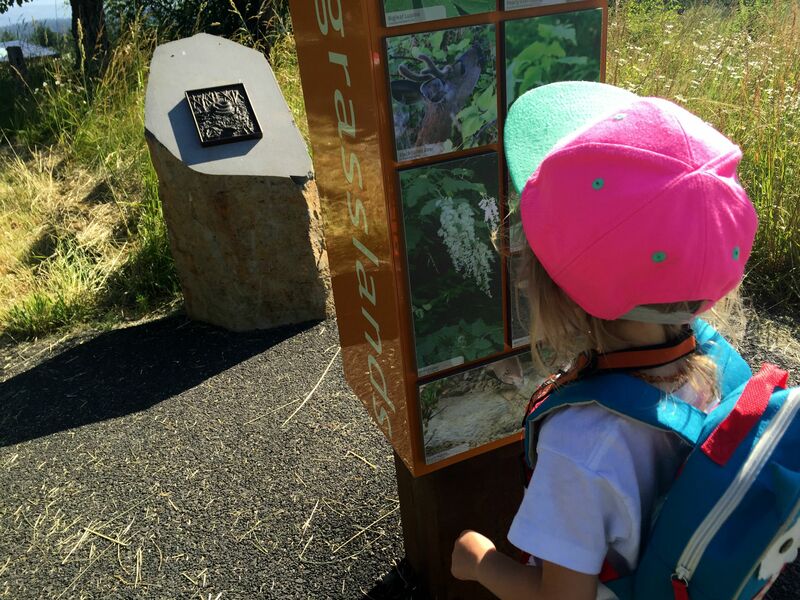 There are lots of benches to rest little legs and signs that tell you about the history of the park and the wildlife you might see. 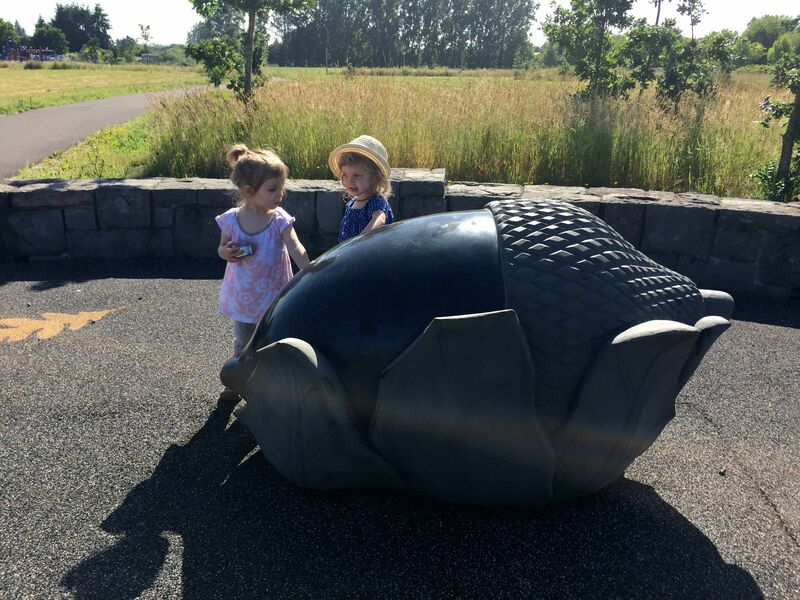 There is also a giant acorn that the big girls just loved. 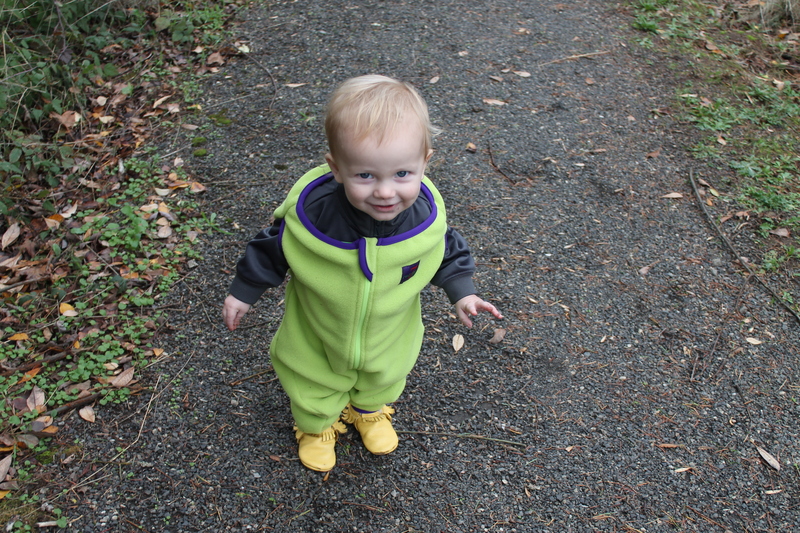 Can we just take a moment and look at how tiny Alder is in this photo below – where has the time gone? These sweet girls walked for what seemed like forever and despite being tired and so hot they made it back to the car and to the snacks. 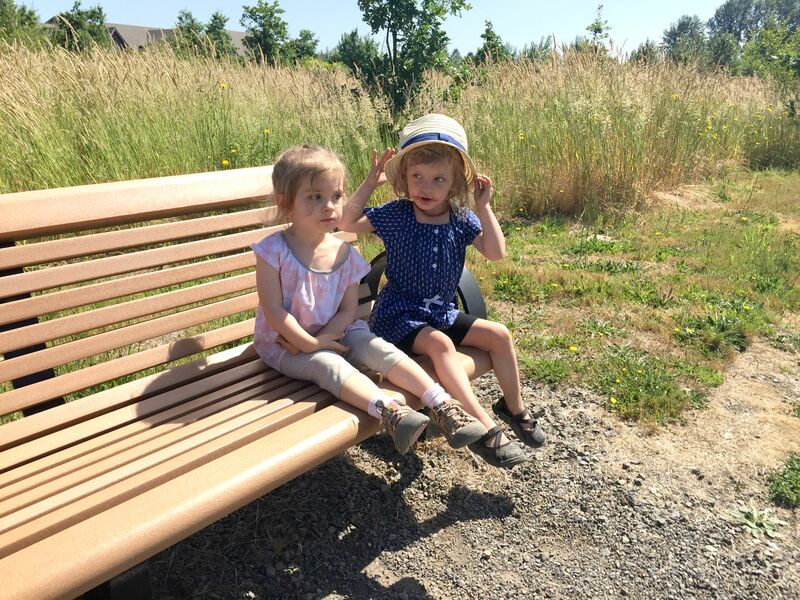 We weren’t without our bench stops to rest….at every bench we came across. I’ll say this Graham Oaks Nature Park is a really beautiful nature park. The paths are nice and wide and if you are looking for a great place to bring out balance bikes or scooters with your little ones this is a great spot. It’s also great for running with a jogging stroller. I would say avoid going on sunny, hot summer days because there is little to no shade to be found except for the really nice covered picnic area near the restrooms. If you are in Portland would I go out of my way to travel there? No, but if you are in the area for any reason and want to stretch your legs it’s a great spot even if to just climb on the giant acorn. Weather Conditions: This is a great spot in most any weather. Like I said above I would maybe avoid hot sunny days because there is very little shade but otherwise it’s great. Need a rainy walk/hike? This would be a great spot because it’s pretty flat and paved in most areas so easy to get around. Stress Factor: None. The paths are wide, there aren’t any drop-off’s or crazy rocks to climb. It’s easy, flat and virtually stress free. Difficulty: Easy. 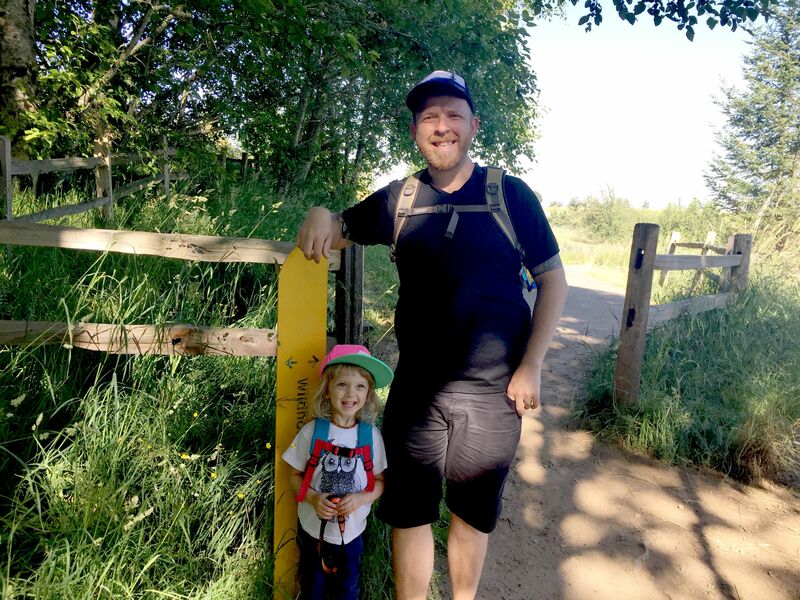 This path is great for all ages, especially little legs because its is flat and wide. 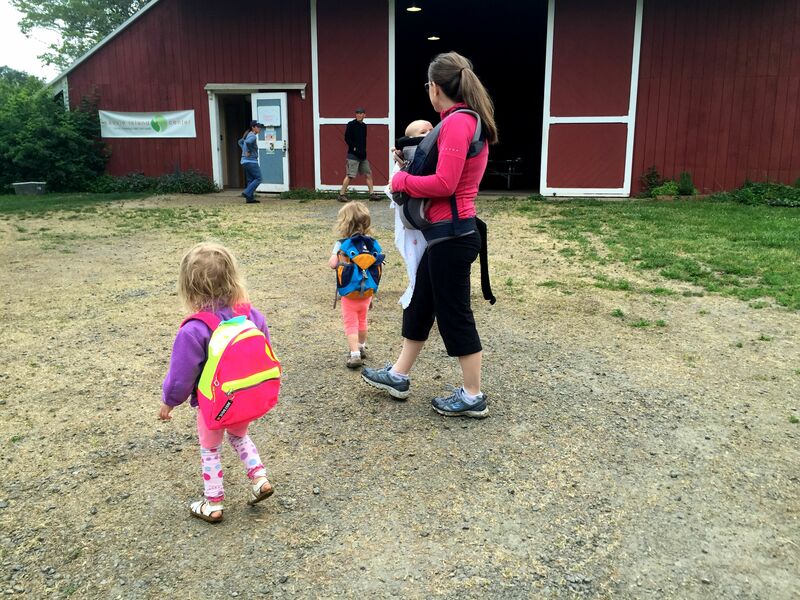 If you do have little ones who want to walk I’d recommend bringing a carrier or stroller as well if you plan to do the full loop. 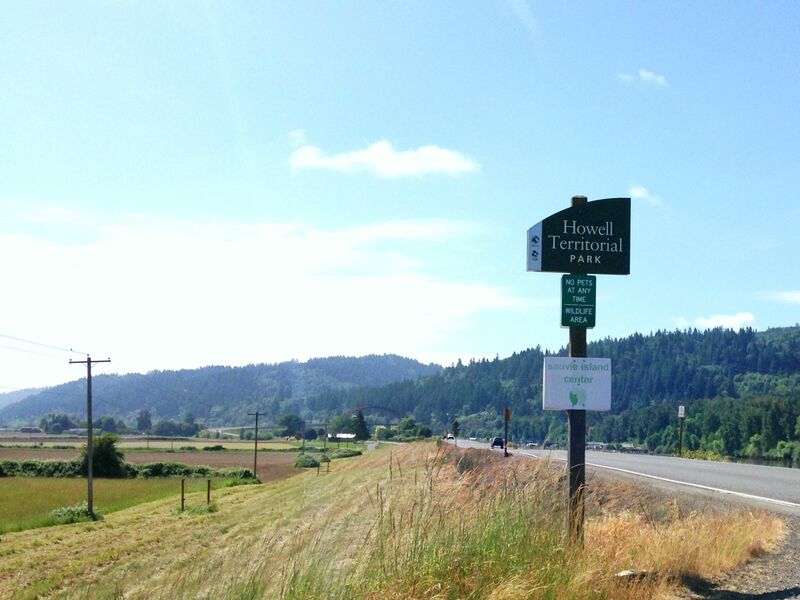 Distance from Portland: 20 miles (25-35 minutes or so). Viewpoints: There aren’t any spectacular view points here just a nice stroll. Bathrooms: YES! There are bathrooms next to the covered picnic area. 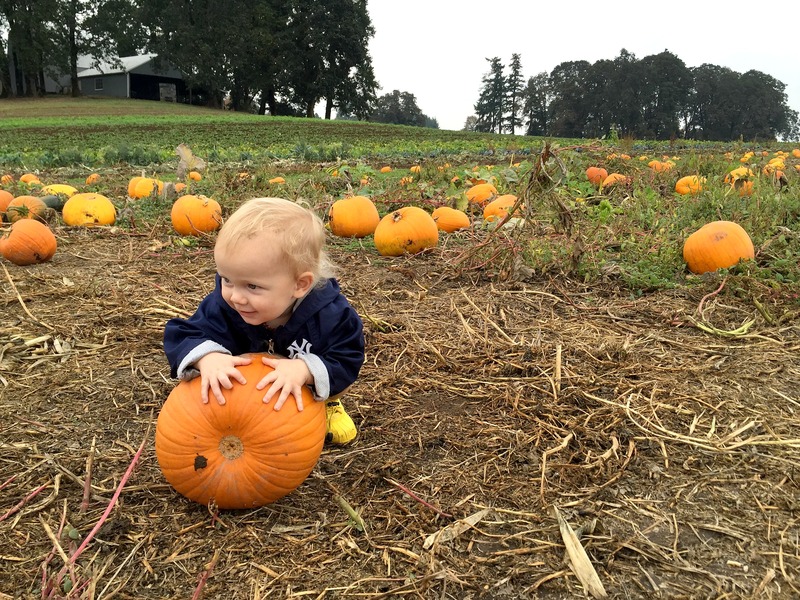 After a bit of a rough start to our Saturday morning we finally made our way to baseball class and then to Sauvie Island to the pumpkin patch. 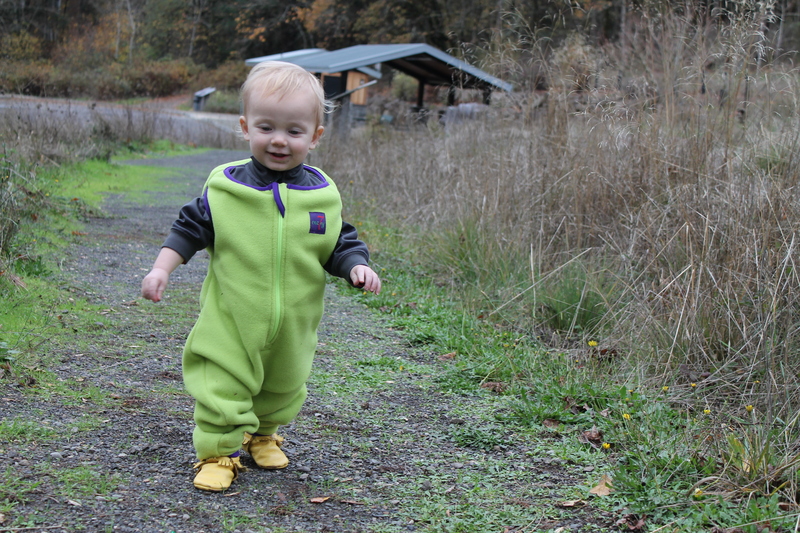 This was Alder’s first real trip to the pumpkin patch since last year he was just a bitty baby. 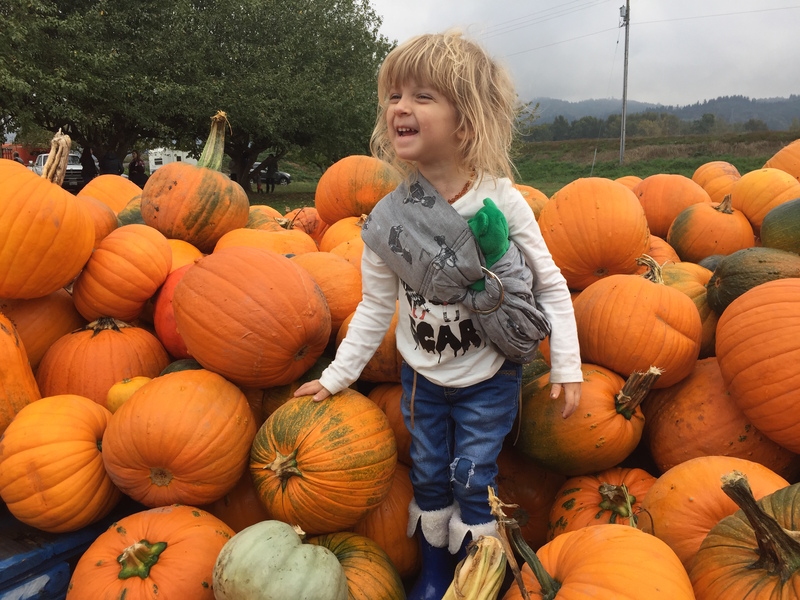 Also now that I think about it while we went to The Pumpkin Patch last year we never actually went to the pumpkin patch instead we looked at the pumpkins in the shop, checked out the animals, Edith and Neil went on a little ride and then we had some corn on the cob. 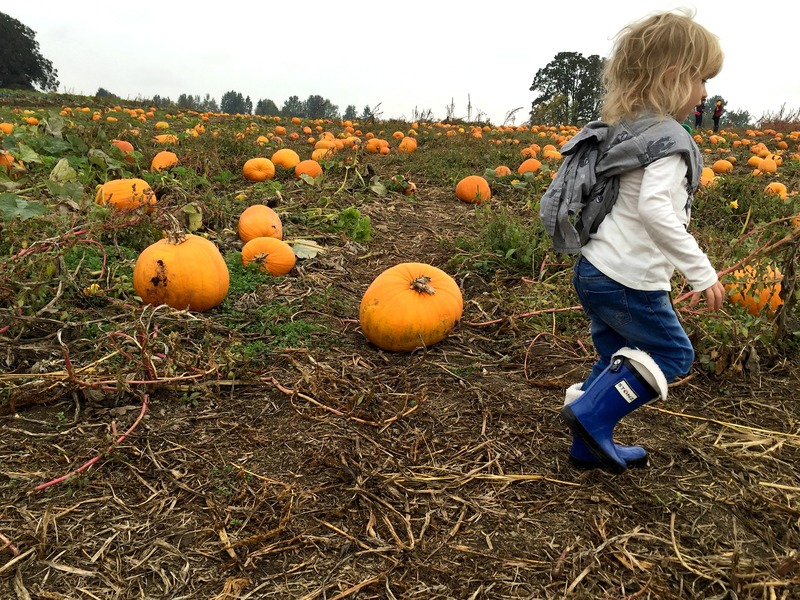 I don’t know how we never actual set foot in the pumpkin patch (you can see that full post here)! 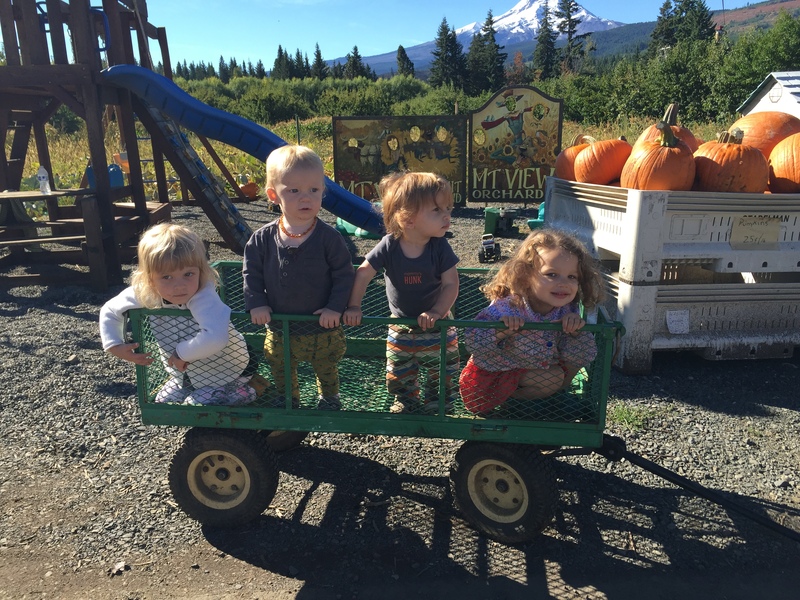 Rewind two year to our very first pumpkin patch trip was when Edith was right around 15 months old. 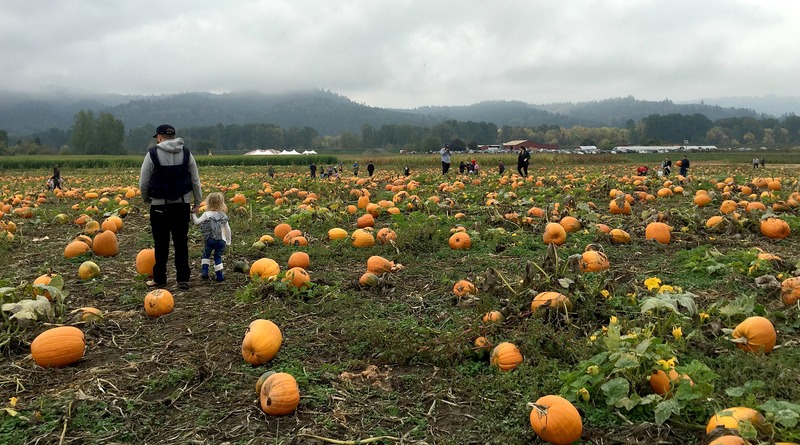 We headed out to Sauvie Island to Kruger Farms to do the corn maze, pick our pumpkin, take a little hay ride and enjoy some roasted corn. Quickly after arriving I realized my choice of footwear, TOMS, where probably not the best idea. 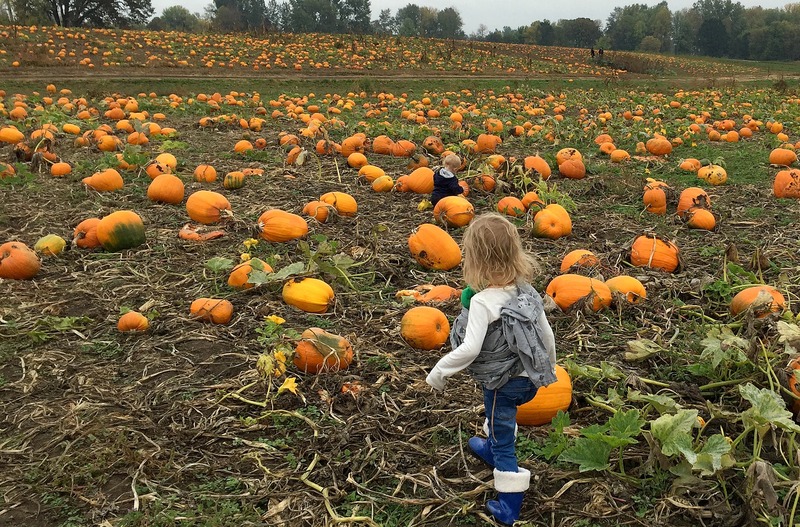 We made it about five minutes in the muddy corn maze before finding one of the escape routes and heading up to get our pumpkin. I ended up destroying those shoes and ended up with very muddy feet. 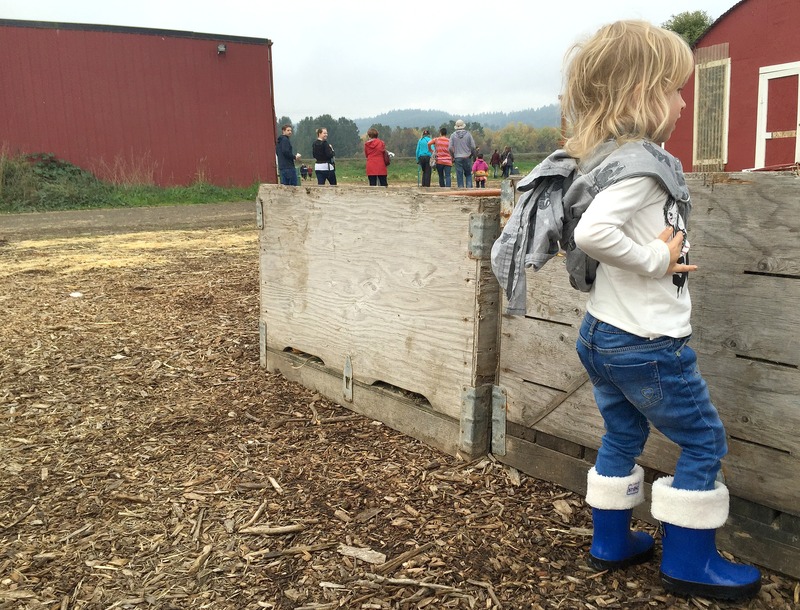 After this experience I learned my lesson and I was never going to the pumpkin patch without boots for the entire family. This year we lucked out it wasn’t too muddy but nonetheless the boots were still essential. 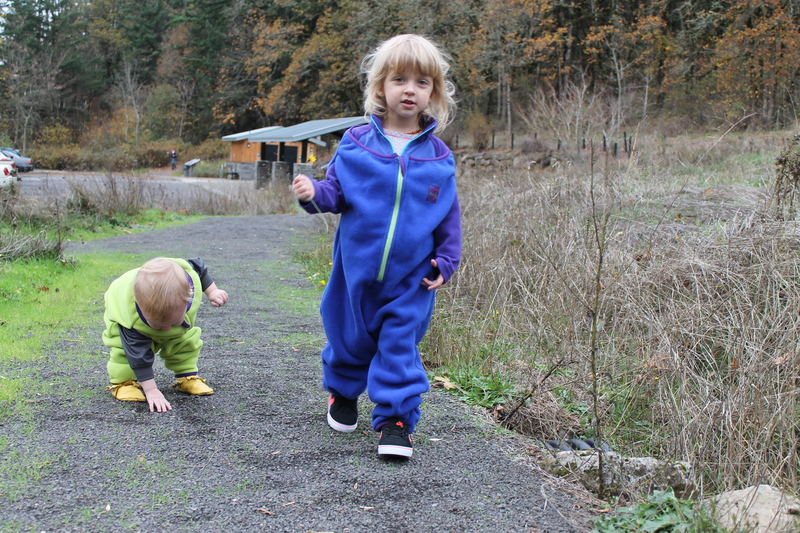 Edith has been obsessed with her new blue boots from Stonz lately and she wears them everywhere. She is also very particular and insists on wearing her rain boot socks aka linerz whenever she wears her boots, no matter the temperature or weather. Alder also has a super cute pair of yellow Stonz rain boots but his little feet are still too small for them so instead he wore a pair Edith’s of hand-me-down boots. Feet warm and secure we walked up to the pumpkin patch on the search for the perfect pumpkin for carving and a pumpkin that was just Edith’s size. Neil and Edith searched and searched while I hung out with Alder while he tried to climb each and every pumpkin he saw. Finally Edith found her perfect pumpkin and we kept searching for a nice big pumpkin but decided that we just couldn’t find the perfect one so we hopped on the hay ride back to the entrance to weigh our pumpkin and to take a few photos in one of those boards with the cut out faces. 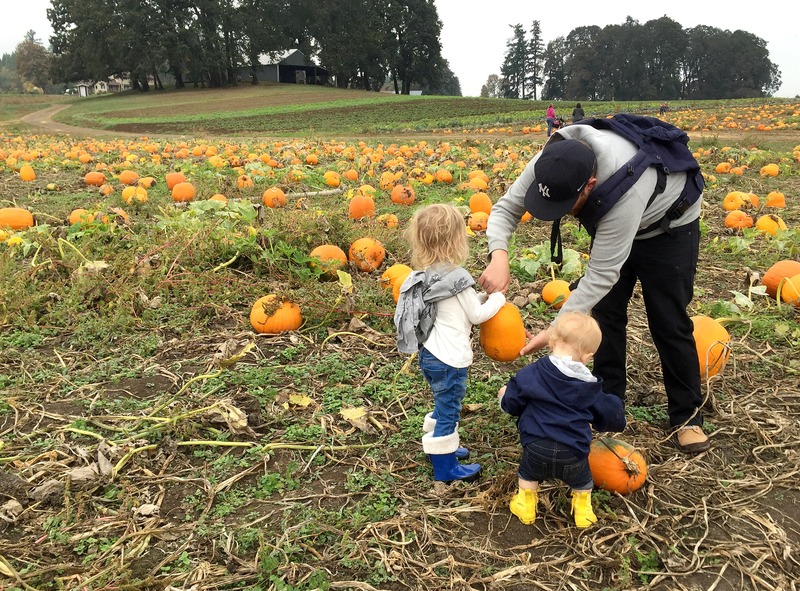 We ended up leaving the pumpkin patch with only one little pumpkin because all of the big ones were either not the right shape or were already rotting. Oh well! 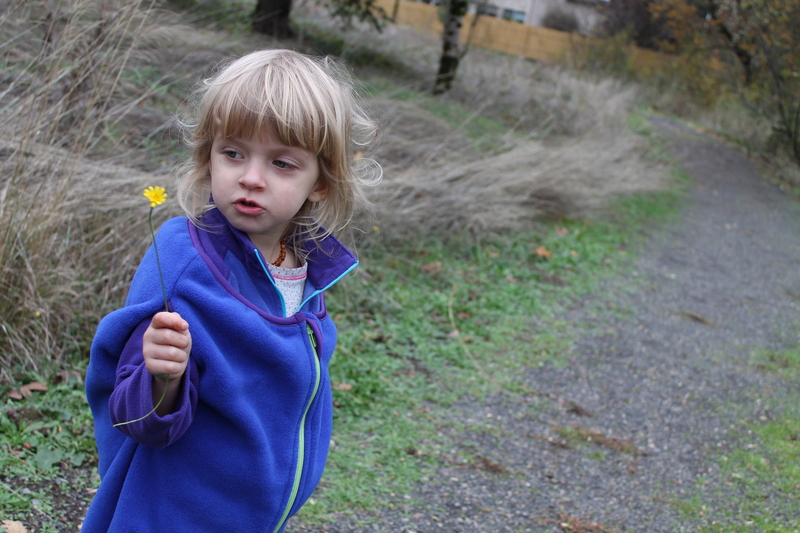 Either way we left with our little pumpkin, some honey sticks, great memories and warm, dry feet. 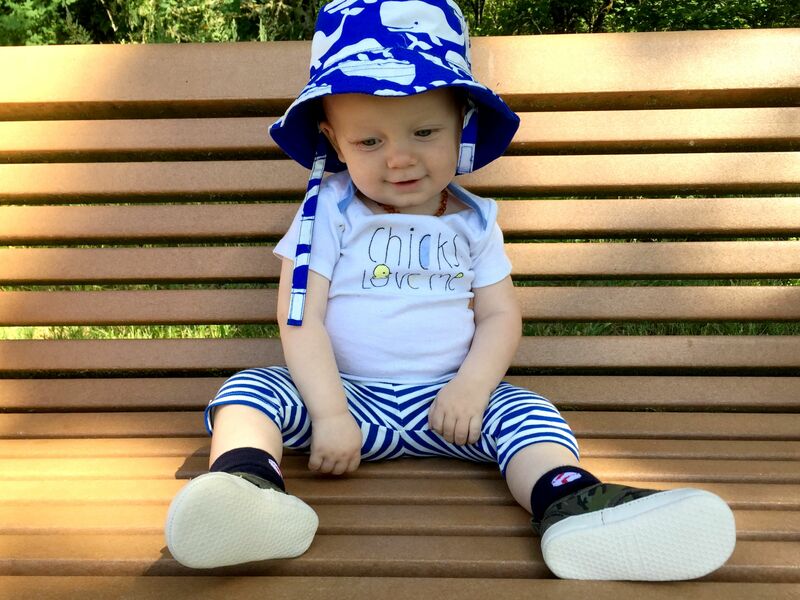 Disclaimer: We would to thank Stonz for providing us with these cute rain boots and linerz for Edith and Alder. We received no compensation for this post. All opinions are our own. 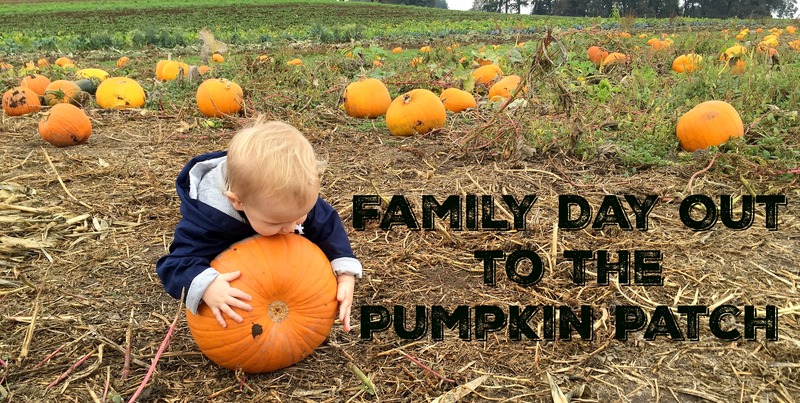 What are your favorite Fall family traditions? 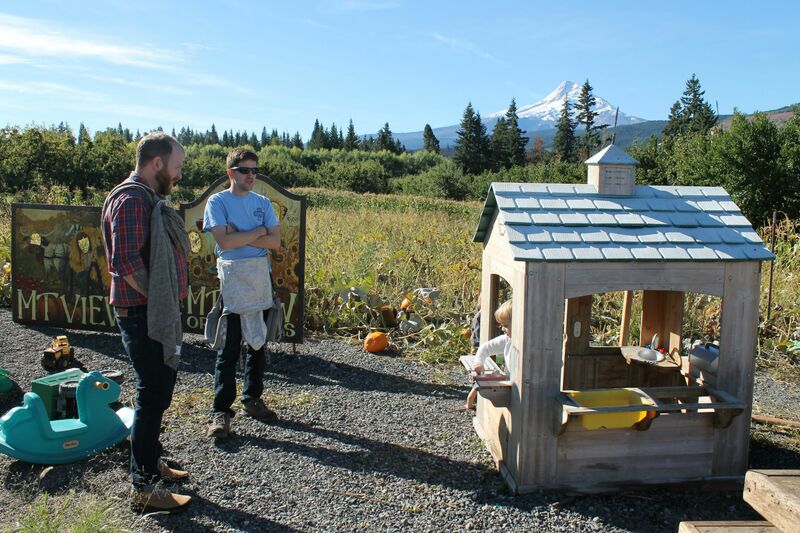 Have you been to the pumpkin patch? 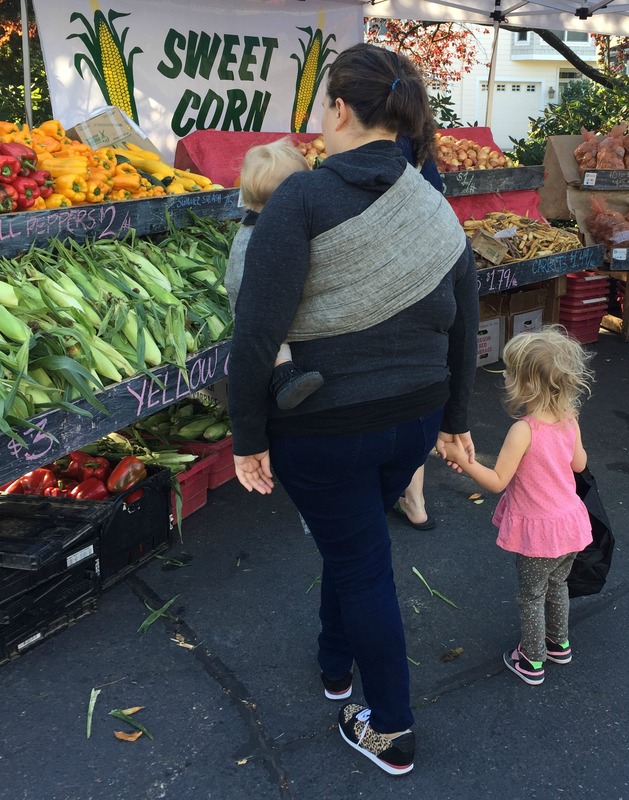 One of our favorite things to do on the weekend is head to the farmers market to do our weekly shop. While there we sample fruits and veggies, breads and whatever else is available. We often pick up a snack to share and watch listen to the live music. 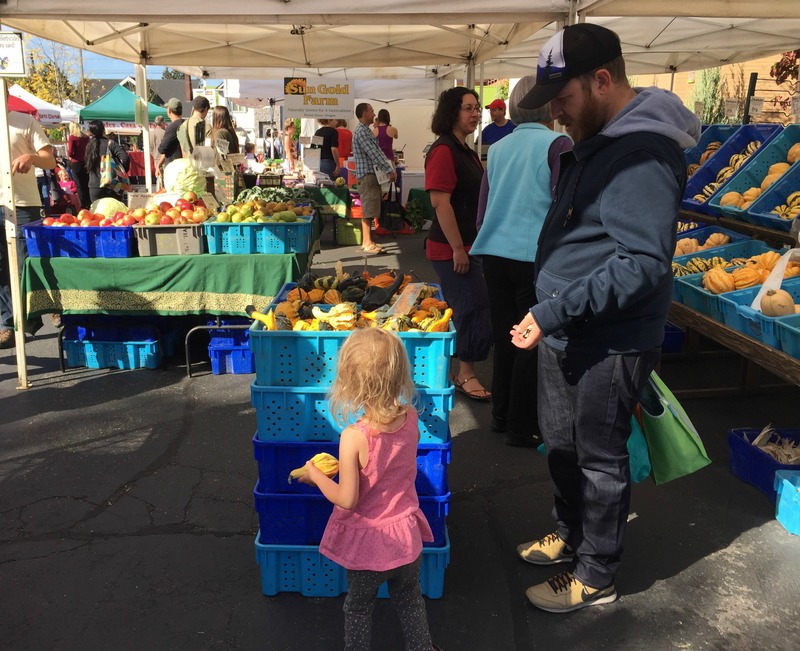 One thing I love about the farmers market is being able to have Edith and Alder participate in the process of picking out what we are going to eat that week. We touch, smell and chose a variety of items. Edith has taken to also paying for our veggies – it’s a delight to see her squeal each time the person takes the money and thanks her. It’s the little things in life am I right? Neil or I always wear Alder because it allows us to be hands free and it allows him to part of the action. He can see better and it allows us to talk to him about everything we are buying, doing or seeing. It really just makes life easier and more fun. 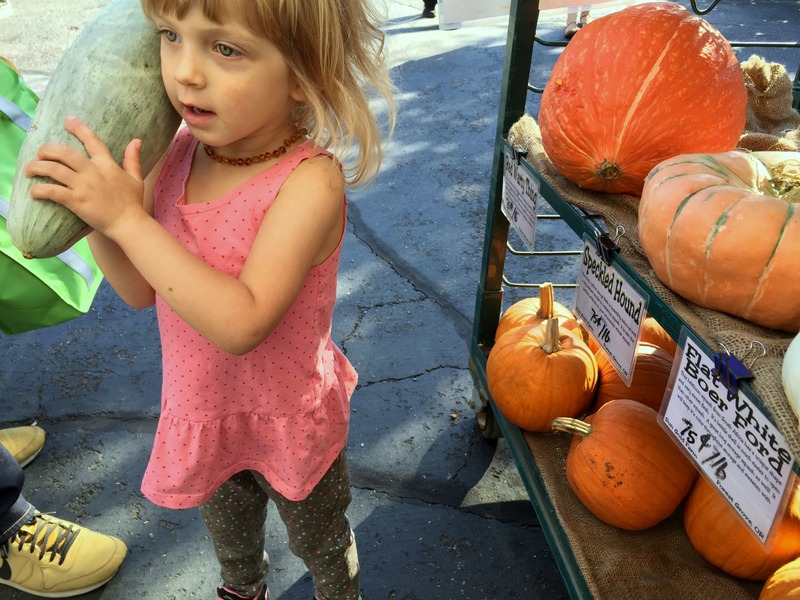 This week Edith found a giant long pumpkin and declared it her phone. I just love her imagination. She also picked out a variety of root veggies that I cooked up in a stew (you can find the recipe here). What do you like to do on the weekends? 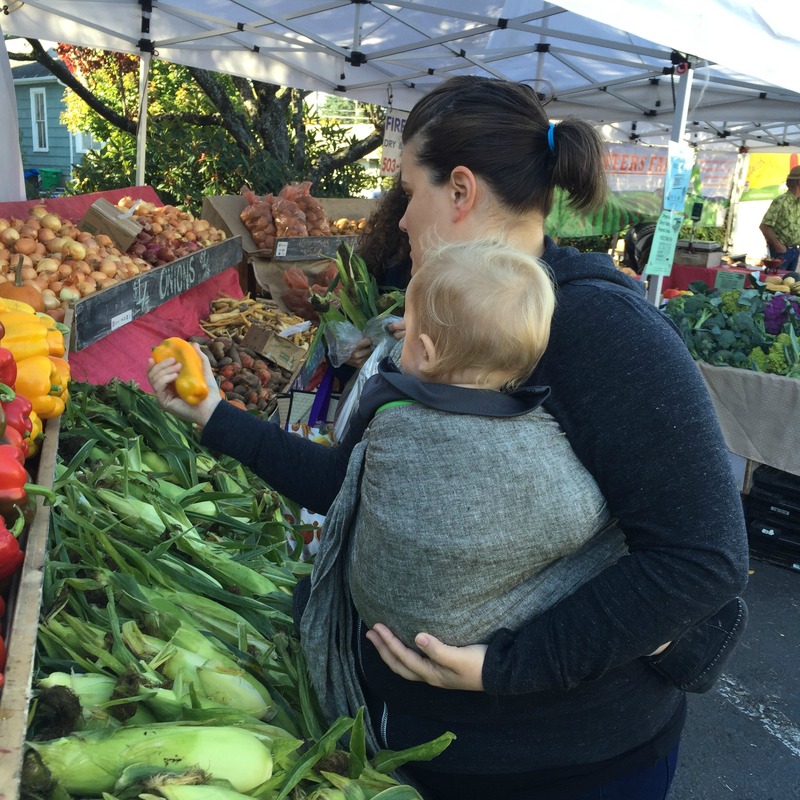 Do you have a favorite farmers market? 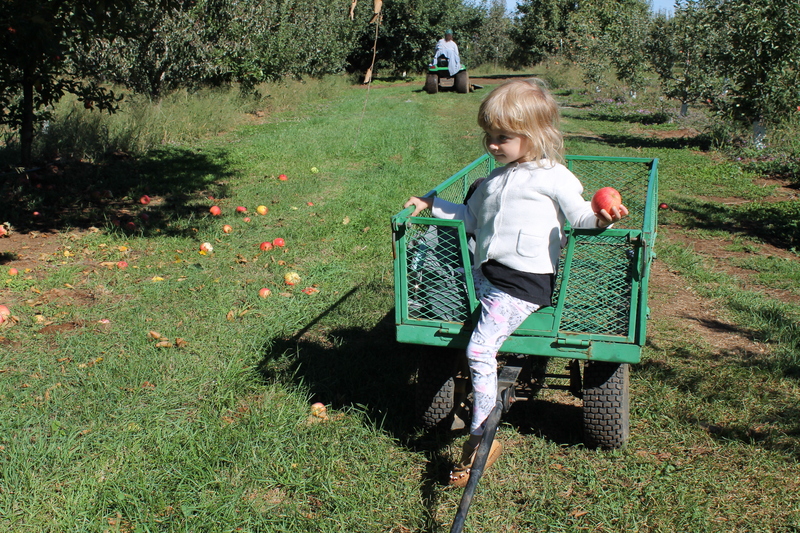 Fall is my absolute favorite time of the year and growing up we always went apple picking in the Fall. 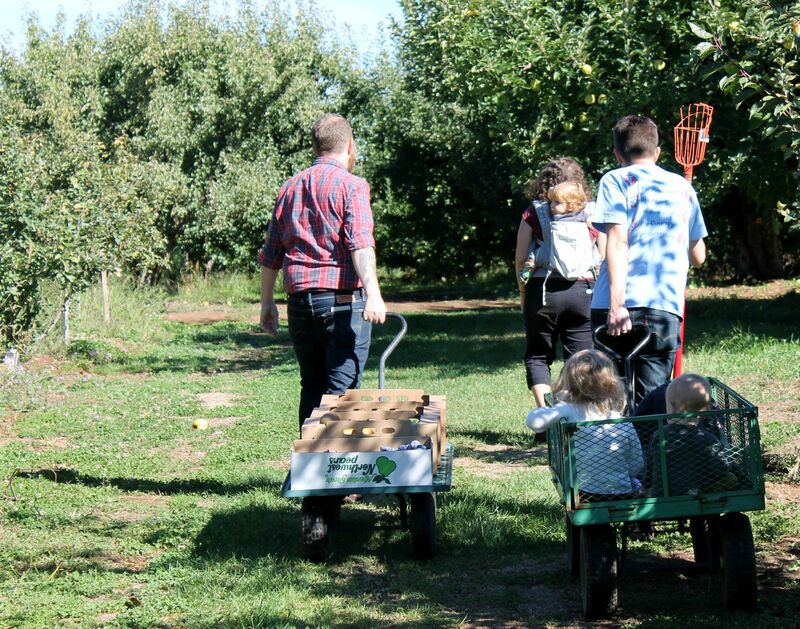 I can remember piling in the car and heading to Grand Isle (Vermont) for the yearly apple festival and we would stop at the orchards to pick apples, eat apple cider doughnuts and sip apple cider. 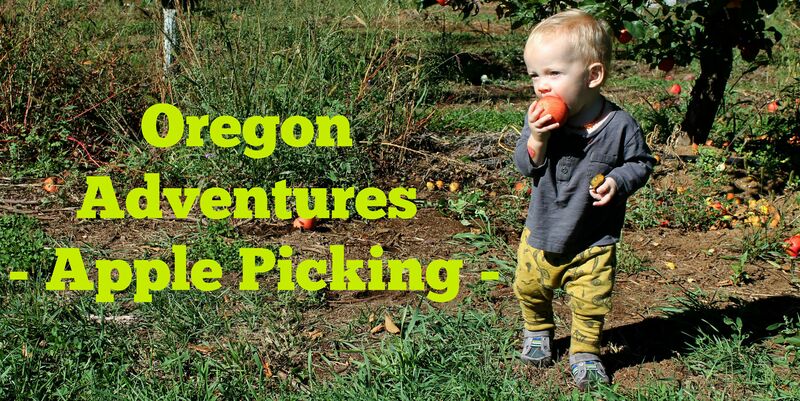 While you won’t find apple festivals in Oregon, apple cider doughnuts and you don’t get that Fall smell (New Englanders/Upstate New Yorkers know what I am talking about) you can still find a few u-pick apple orchards most of which are in the Hood River area. We had a bit of trouble finding an orchard that still had apples because due to the hot weather the apples have ripened 2-3 weeks earlier than normal. 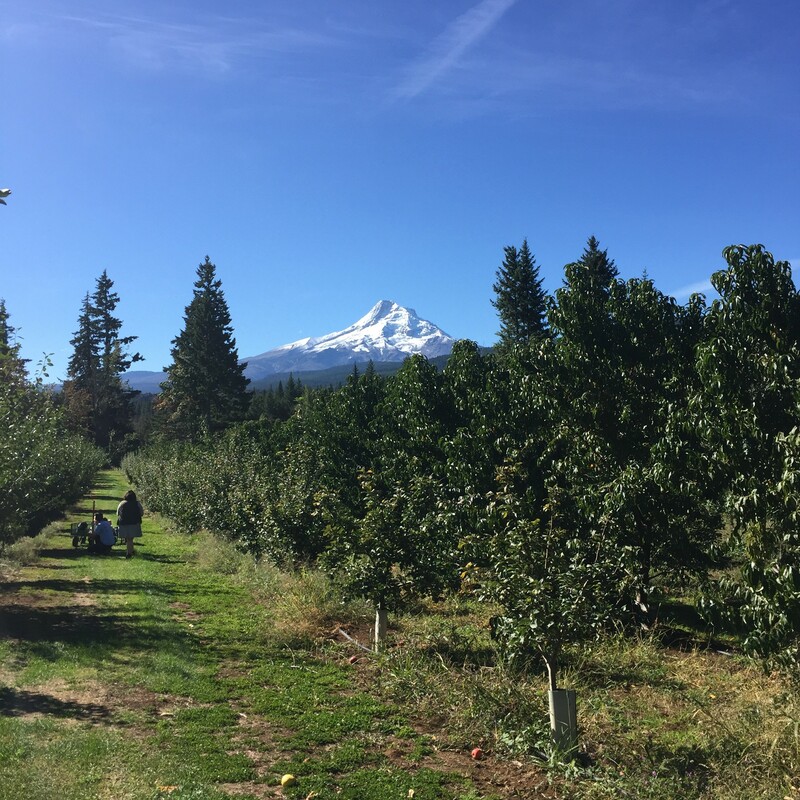 After finding out that our first two picks were out of apples we finally (at 11pm the night before) we found Mt View Orchards and it certainly lived up to it’s mountain view name. 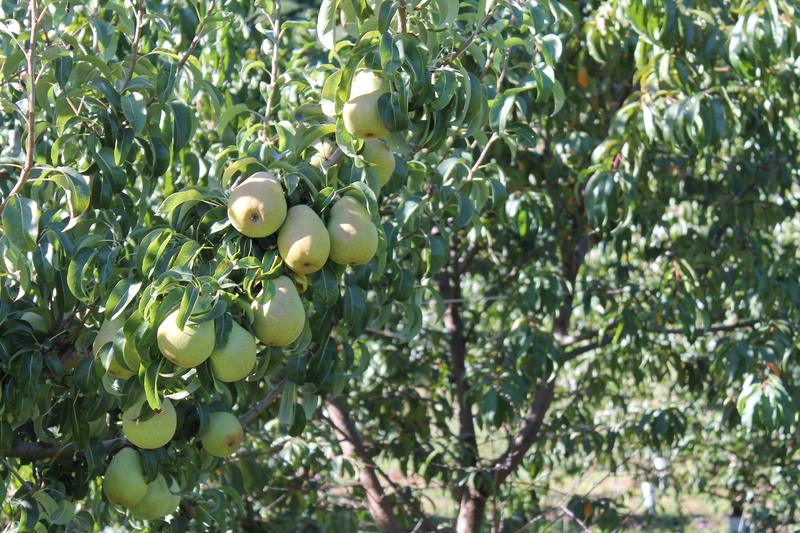 Once we arrived at the orchard we found out that they had not only 70 varieties of apples to pick but also Italian plums and a few different varieties of pears. The best part they were only $0.50 per pound!! 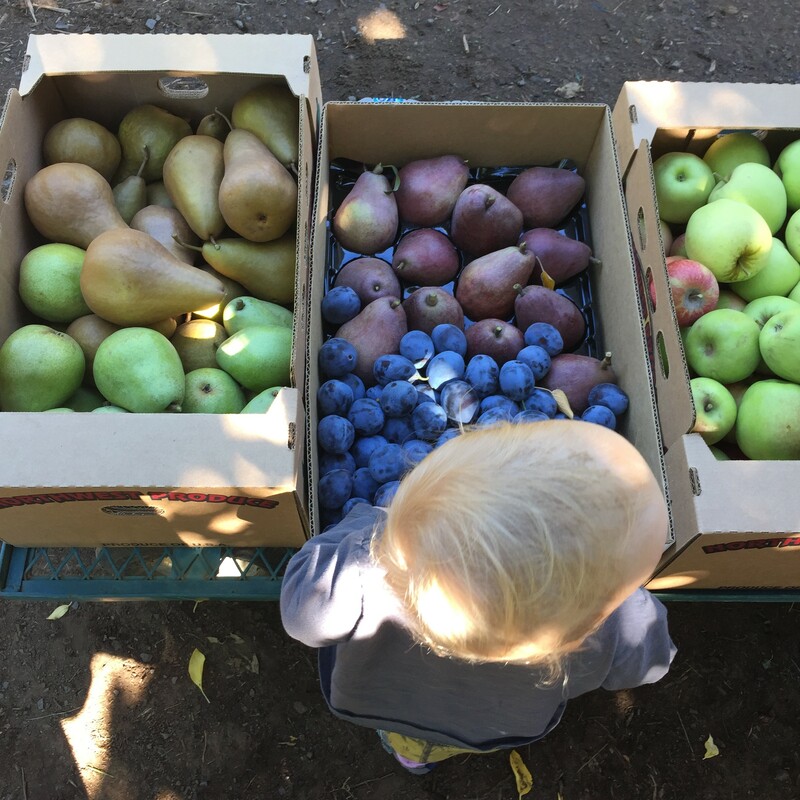 We ended up heading home with 40lbs of fruit – I see lots of dried fruit, pies, baked apples and stewed fruit in our future. We picked and picked and picked. 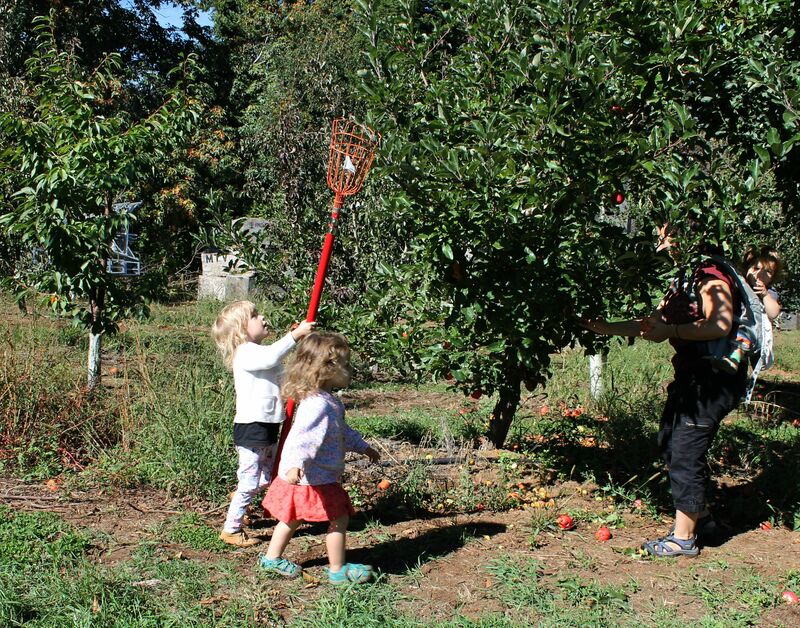 The kids had so much fun picking the fruit, munching on plums and running through the orchard. 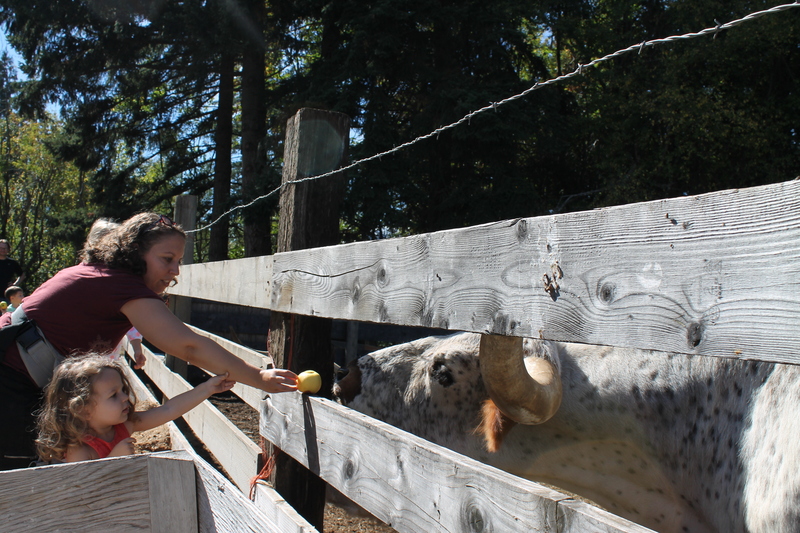 Mt View even had a hay ride through the orchard, a few animals including a Texas longhorn and a play area for the kids. The staff and owners were friendly and helpful as well which just made the experience even better. The only thing I could have asked for was a crisp Fall New England day (haha). 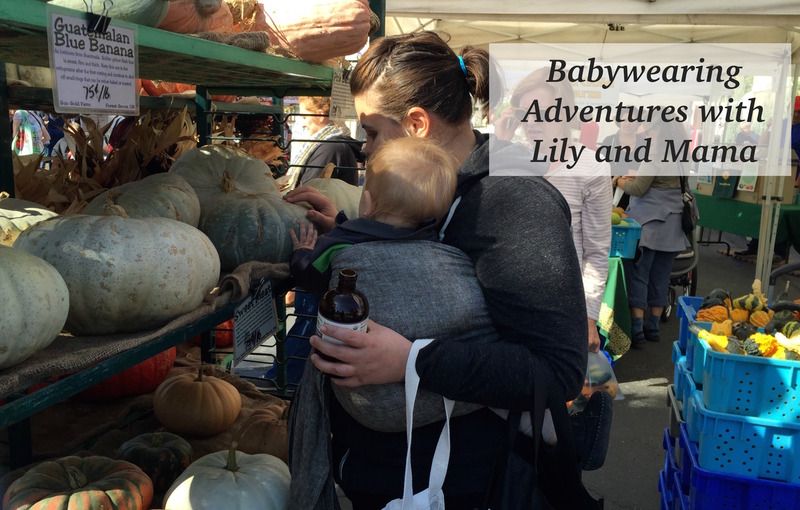 Here I am once again catching up on posts from adventures we have taken over the past few months. 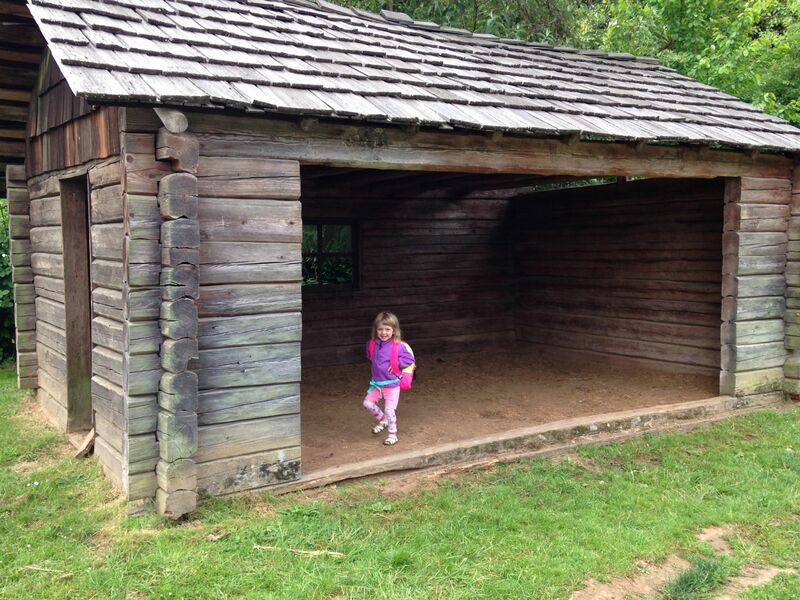 This time it was a trip to Howell Territorial Park on Sauvie Island. This was one of those adventures that I honestly had no idea what we were getting ourselves into. 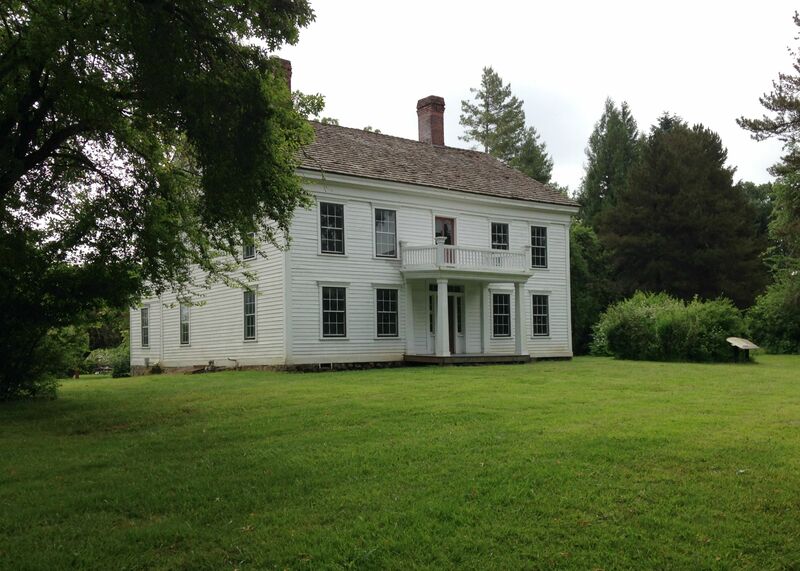 All I knew was that there was an old house, an apple orchard and some trails to walk on. Things started off pretty well until we started to look for a trail to walk. The trail we found was covered in hay and for out littles it wasn’t the easiest to walk on. 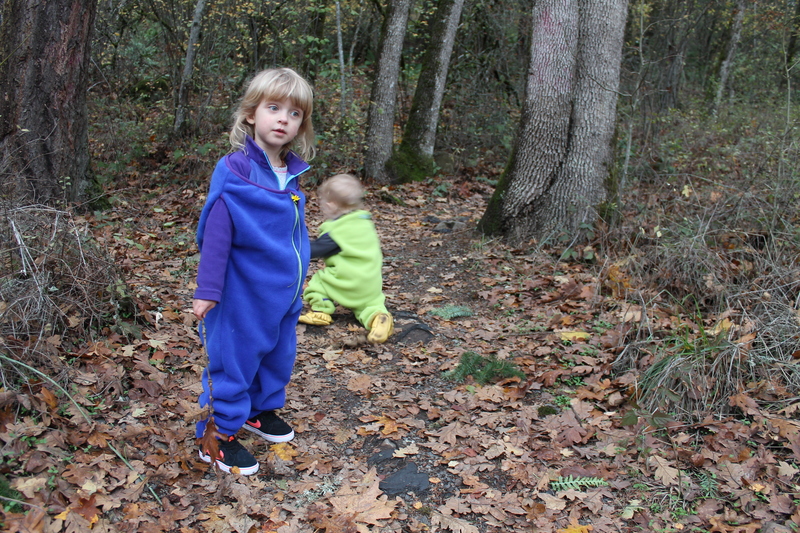 Edith had on sandals and after awhile we realized that maybe this nature walk just wasn’t the right fit for us. We never real found a good trail and in the end the overgrown grass was too much for everyone. So we decided that heading back to the picnic tables for a snack and running around was a better idea. For this snack date we had Matt’s Munchies fruit snacks. These are basically fruit leathers but in little squares which make them easier and more fun to eat. Now this wasn’t my first time enjoying Matt’s Munchies but it had been years so I was excited to try them again. I tell you they were even better than I had remembered. We all were pretty hungry so we ended up trying every flavor. While we really enjoyed most all of them the ones that stood out were the Island Mango (coconut and mango), Banana Coconut and Banana were the hands down favorites. The only two flavors that weren’t popular with the adults or littles were the Mango Acai and the Mango Ginger, however if you are a big fan of ginger or are looking for a tummy tamer the mango ginger would be perfect for you. Overall Matt’s Munchies was a snack date winner! 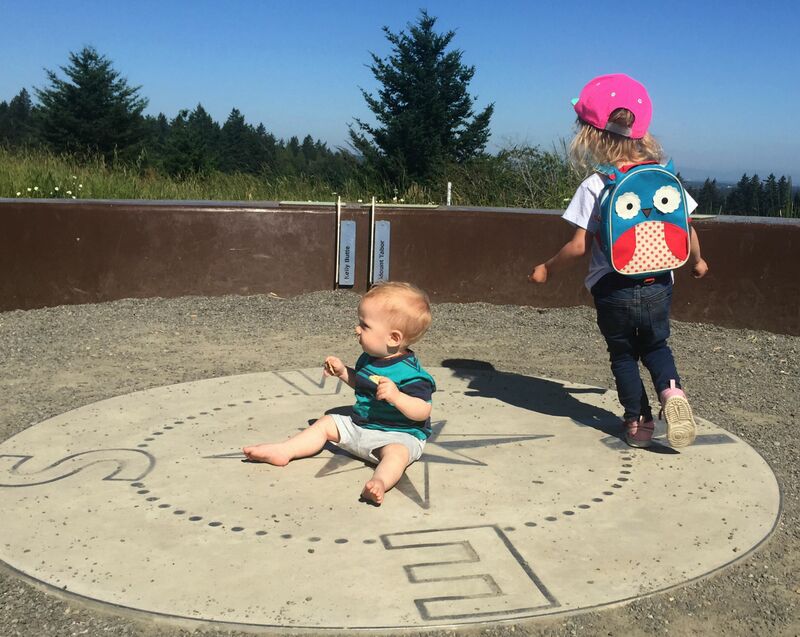 I don’t know why it took us so long to visit Powell Butte Nature Park but we finally made it there. 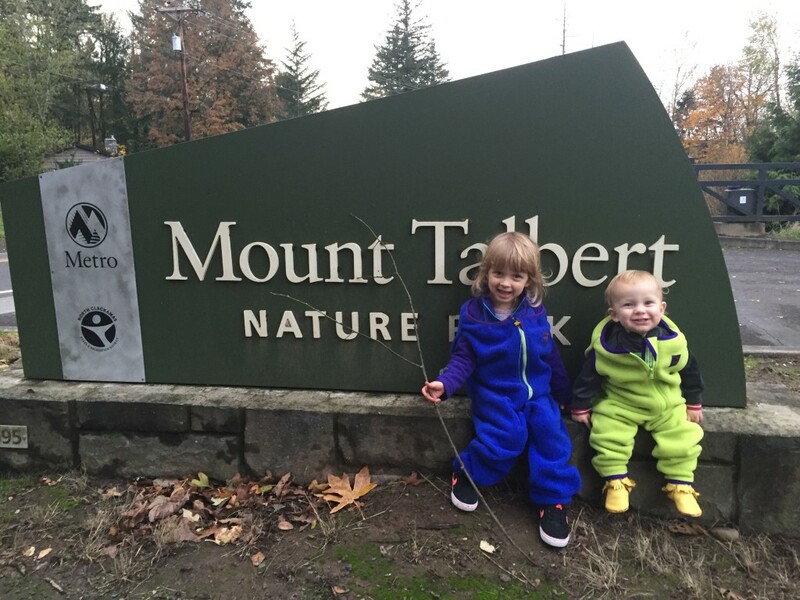 I had no idea what to expect but it ended up being a really great hike especially with littles. 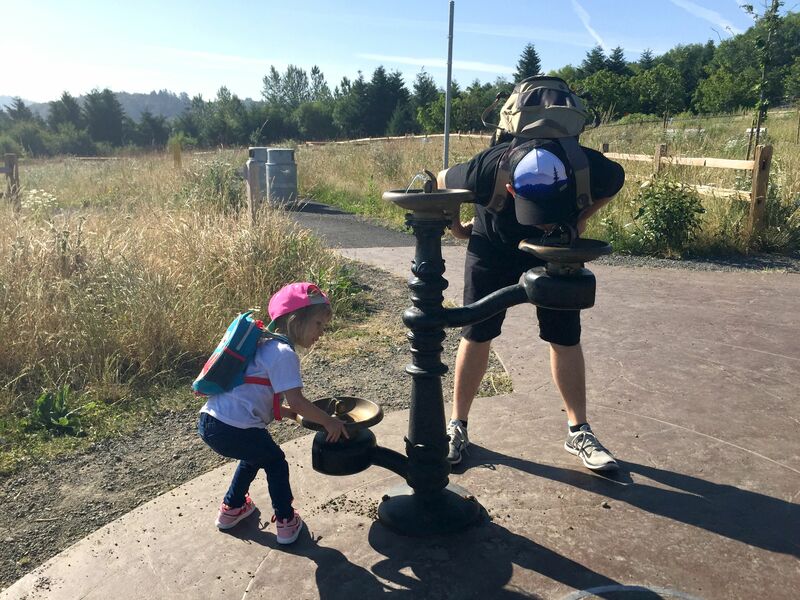 I have to admit that we hiked Powell Butte a few months ago now and I am just getting around to posting about it and I tell you Edith has grown up so much just in the last two months. 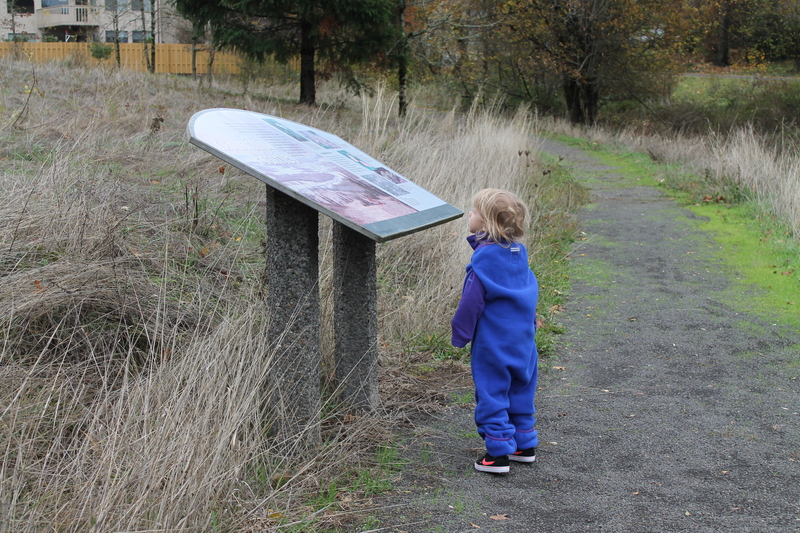 Looking at this photo of her and Neil at the trail sign and I can’t believe how much she has changed. 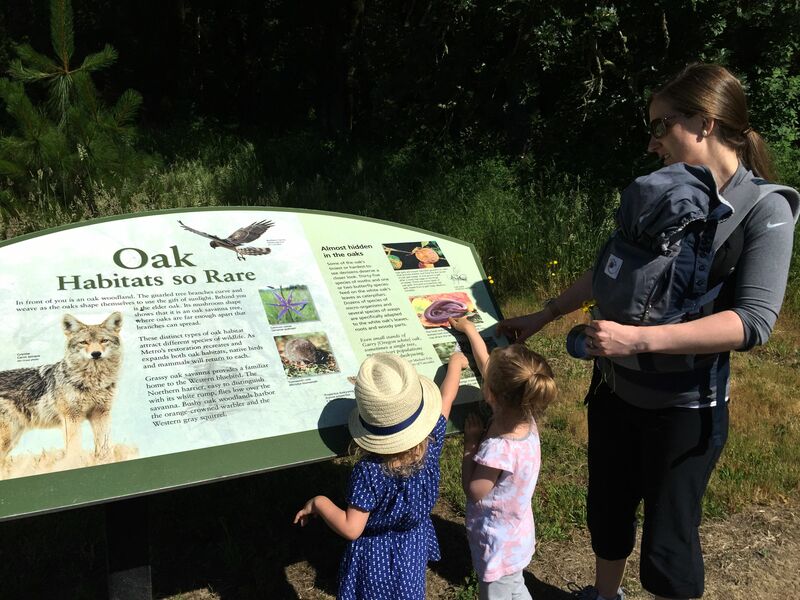 One of the really fun things about this hike was all of the nature signs that showed you what creatures and plants you might see in the various areas of the park. It was so interesting to see all of the plants, animals, reptiles, insects, ect that live there. 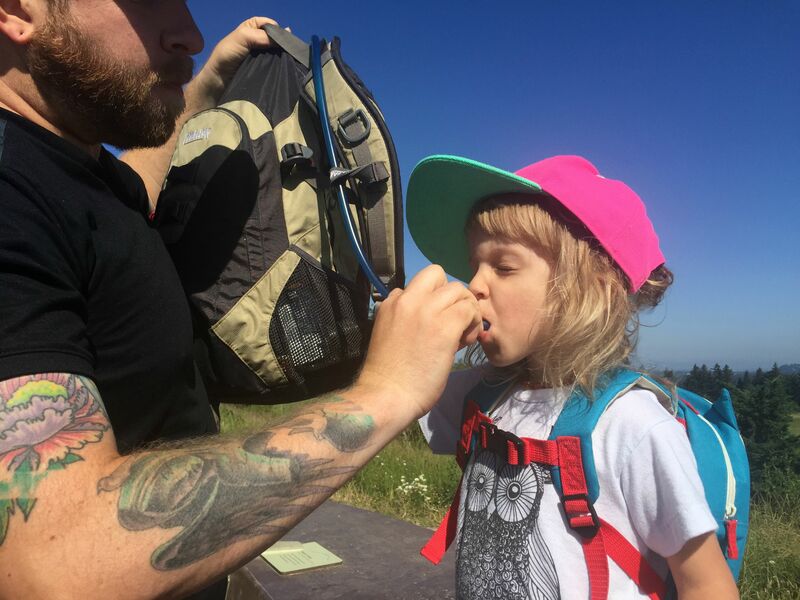 Now the actual hike up to the butte is pretty easy for little legs so it made it the perfect hike for our family. Once you make it to the top there is a spot that lays out all of the mountains that you can see (on a clear day) from the top of the butte. Plus it mazes a great spot to run in circles. We didn’t end up making the loop around the butte but we will be back soon to give it another go. The only thing you have to be aware of are there are also bikers on these paths so keep your eyes peeled! While this is a great hike for little legs sometimes those legs want to ride back down the hill. 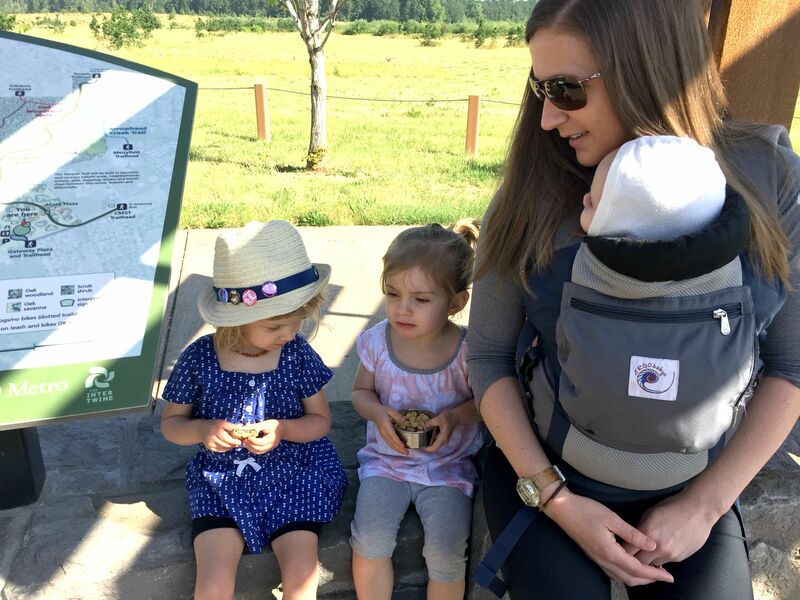 Overall this was a great toddler friendly hike with lots of informational spots, the hike was easy for little legs and it had a great view. There are also learning centers on site as well however they were not yet open during our visit. 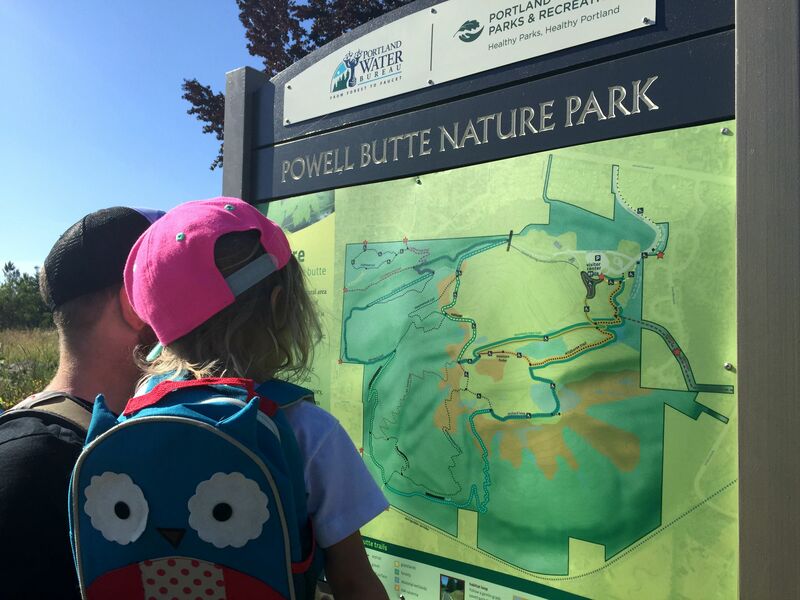 Who else has visited Powell Butte? Thoughts? 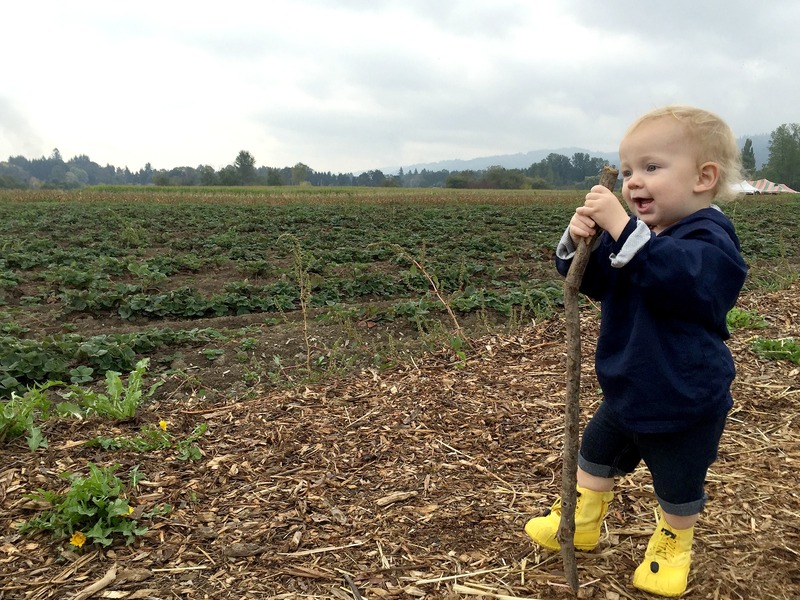 What are your favorite Portland area hikes? There is officially a few more weeks before Summer turns into Fall. 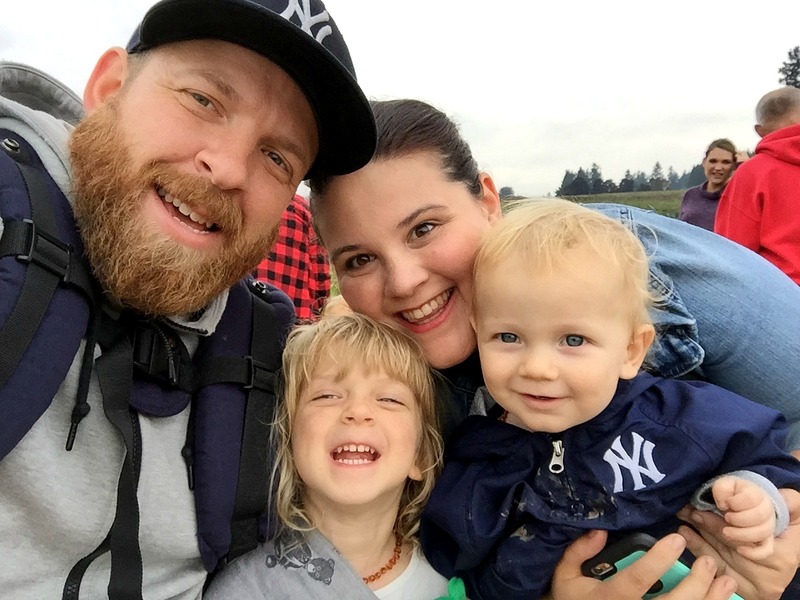 While we are in the midst of trying to get ready to move I can’t help but think about trying to fit in a few more fun things before the summer is officially over and the rainy season starts here in Oregon. So I reviewed our bucket list and we have actually accomplished most of the items on it. 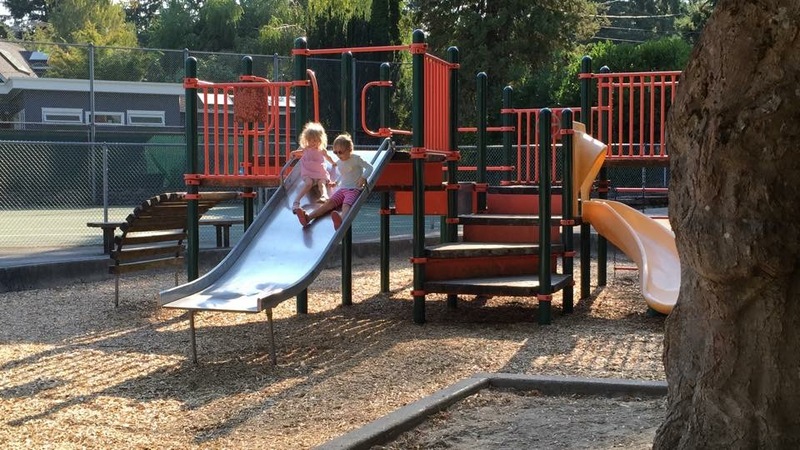 Visit a new park or playground. CHECK. Go for a bike ride. CHECK. Enjoy a big bowl or cone of ice cream. CHECK. Attend an outdoor music event. 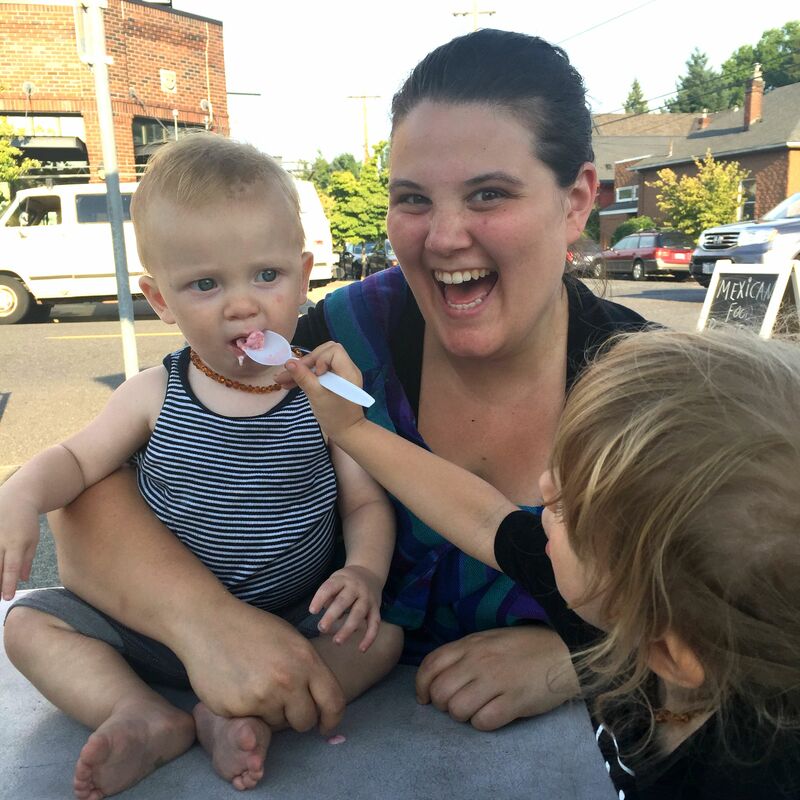 Make popsicles and enjoy them outside. Go for a train ride. Feed the ducks/geese at the pond. What is/was on your bucket list for the summer? How many have you accomplished? Any musts before the summer is over? I think that attending an outdoor music event and going for a train ride are highest on our list.